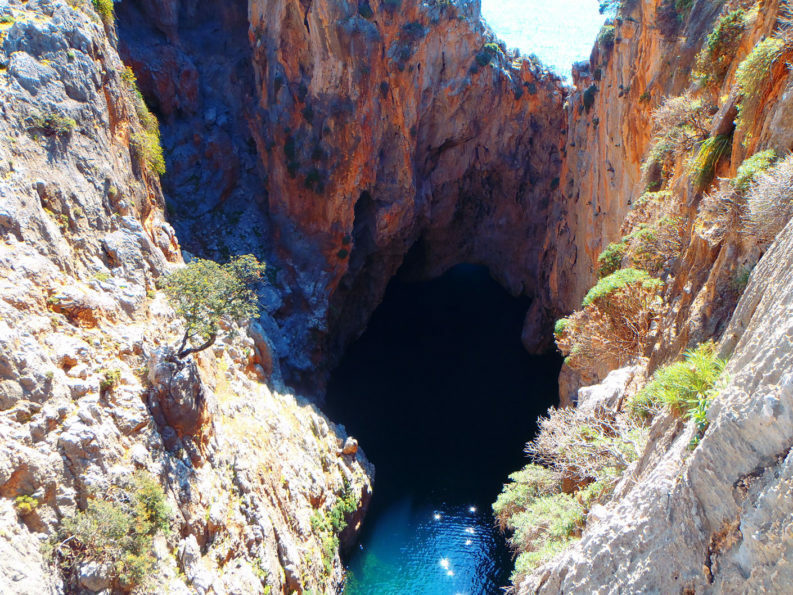 Canyons and hikes on Crete: Gorge in Crete: An overview of the most famous gorges on Crete, canyons and hikes on Crete. 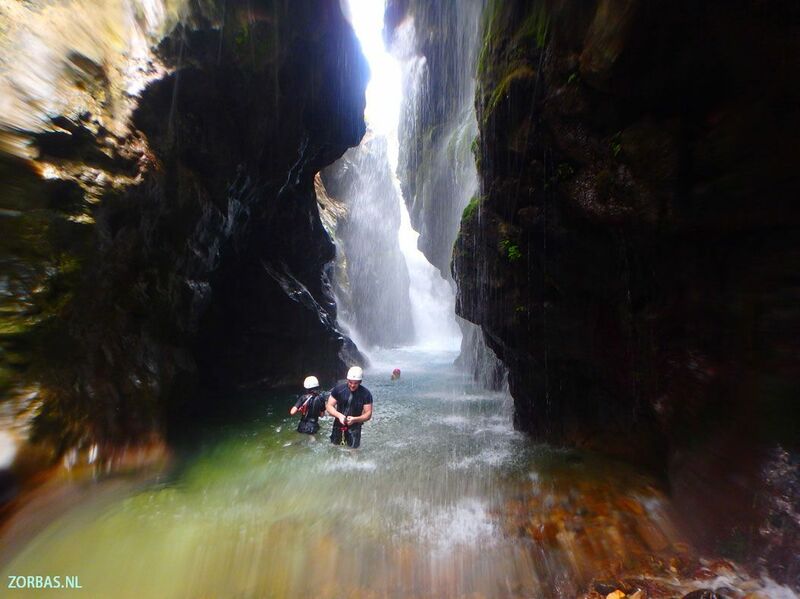 Sometimes we have a link to another page where the gorges are more described into detail. Imbros Gorge Crete: An easy 2 till 3 hour hike, available from April to November. This 6 kilometres stretch starts in Imbros and ends in Komitades. Suited for all ages. 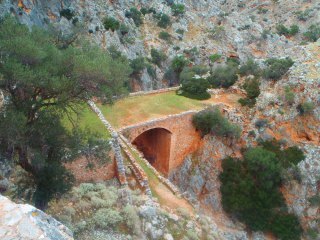 This gorge is the old connection road, allowing people travelling from the Sfakia region to get to the rest of the island. The landscape in the Imbros gorge changes from grey rocks to yellow stones. 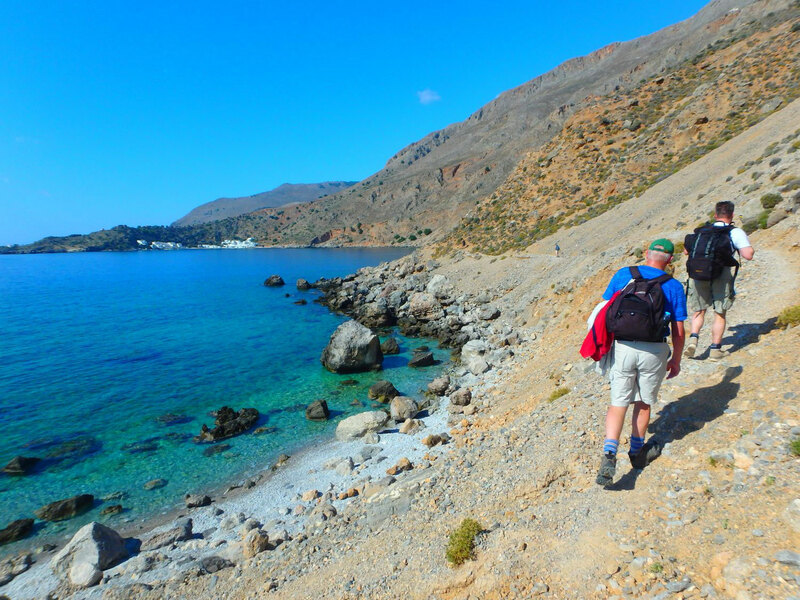 Glika Nera – Loutro: A difficult 3 hour hike, available from April to November. This 4,5 kilometres hike starts in Chora Sfakion and ends in Loutro. Not suited for children. This route contains a few difficult parts, which makes it even more exciting. 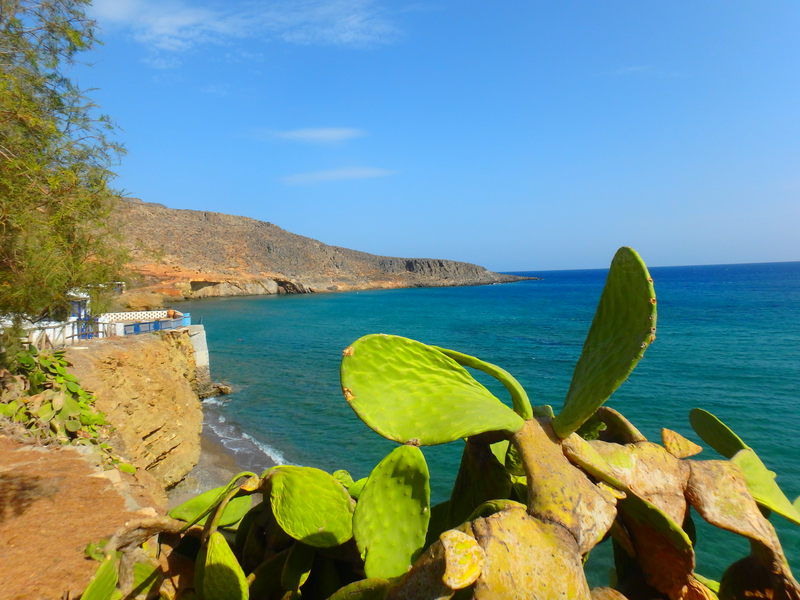 Along the way you will walk alongside one of the most sensational beaches of the island. During the hike you have a beautiful view of the sea and therefore it is also nice to take a look during sunrise or sunset. 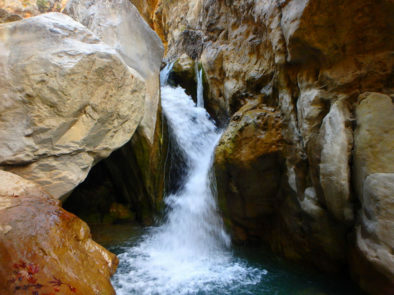 Aradena Gorge: A challenging 4 hour hike, available from April to November. This 5,5 kilometres stretch starts in Loutro and ends in Aradena. Not suited for children. 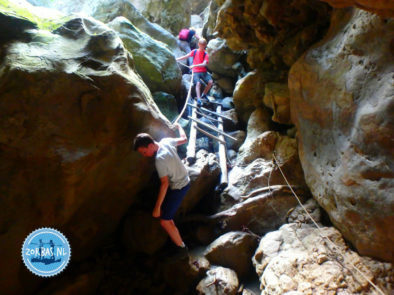 This tour starts with a small hike upwards, after which you will have a nice view of the sea. From this hill top you can see the archaeological excavations of the old city of Phoenix. Along the way you will have to climb stairs and a number of rocks of about 10 meters high, which the actual fun part of the excursion. Agia Irini Gorge: An easy 3 hour hike, available from April to November. 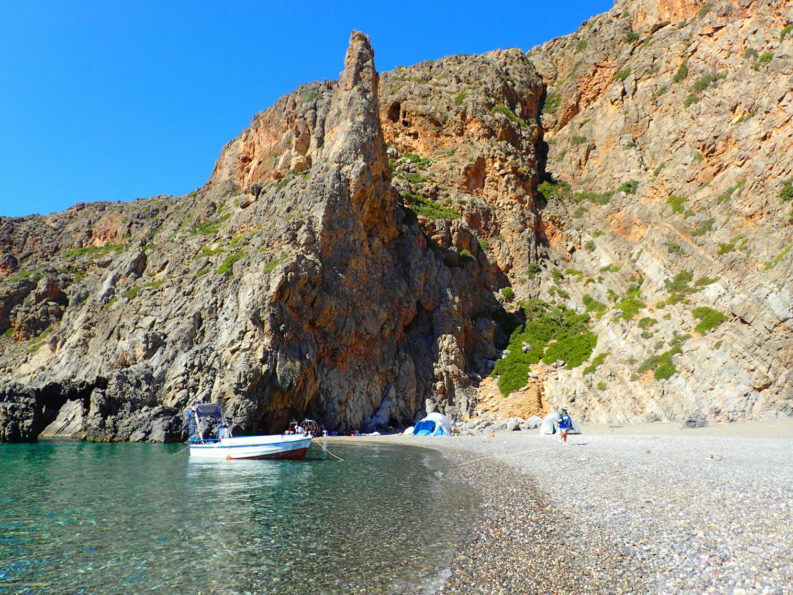 This stretch starts in Agia Irini and ends in Snack bar Oasi. Suited for children from the age of 12. 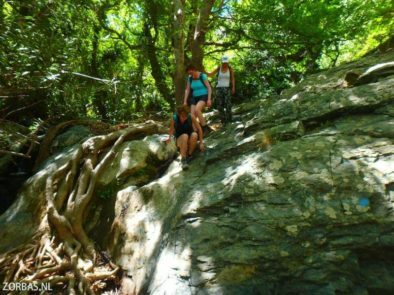 This tour is all about nature; you will see many trees and plants growing on rocks. Along the way you must cross several rivers by means of wooden planks. There are some other challenging parts en route as well. 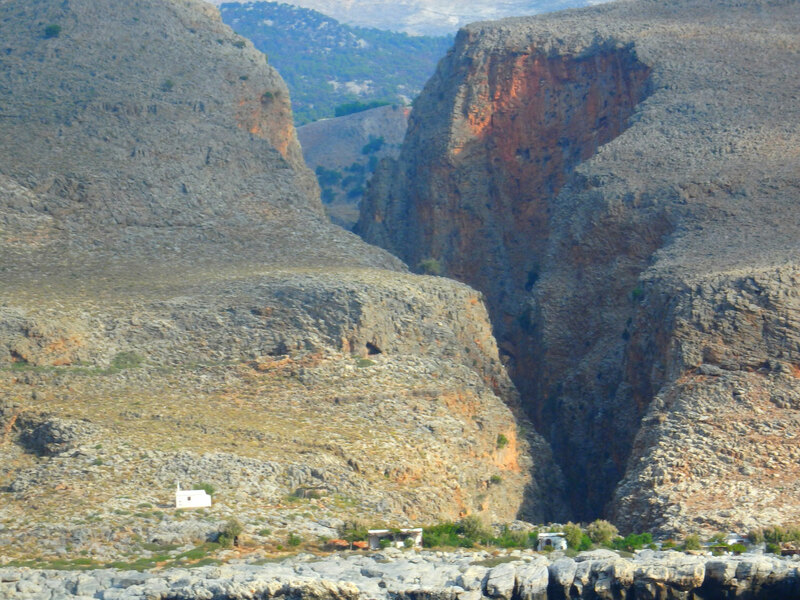 Lissos: A difficult 3 – 4 hour hike, available from March to December. This 3,5 kilometres stretch starts in Sougia and ends in Lissos. Suited for all ages. During this walking trip you have some spots with a gorgeous view of the sea. 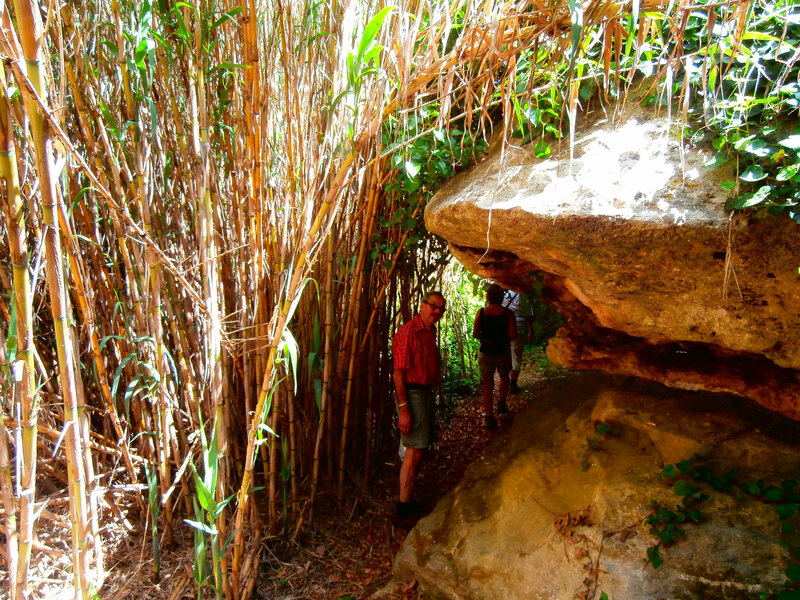 You walk in between rock formations, where you can see many varieties of plants that grow here. During this trip you will also come across two archaeological sites. 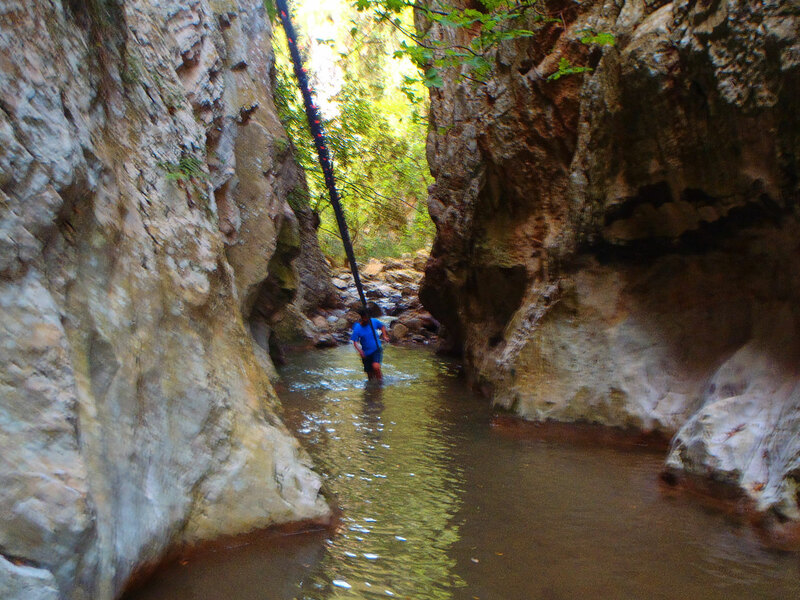 Anidri Gorge: An easy 2,5 – 4,5 hour hike, available from April to November. This stretch starts in Anidri and ends in Gialiskari. Suited for all ages. 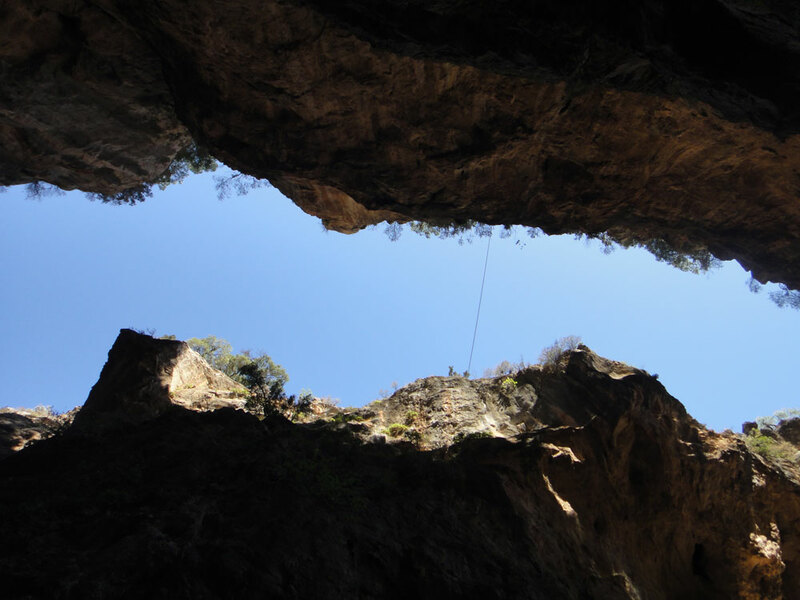 This excursion contains a climb, during which you will have to help yourself up a few meters by means of a rope. There are also many rocks that you have to climb over. 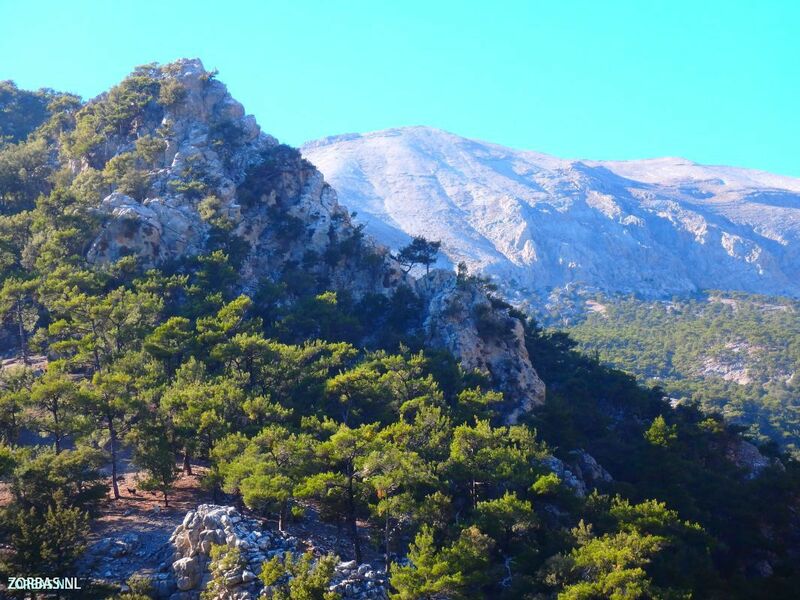 From Cape Krios to Elafonissi: A difficult 5 to 6 hour hike, available from March to December. This 8 kilometres stretch starts Cape Krios and ends in Elafonissi. Not suited for children. This trip takes you along various beautiful beaches and also many spots from which you will have a beautiful view of the sea. 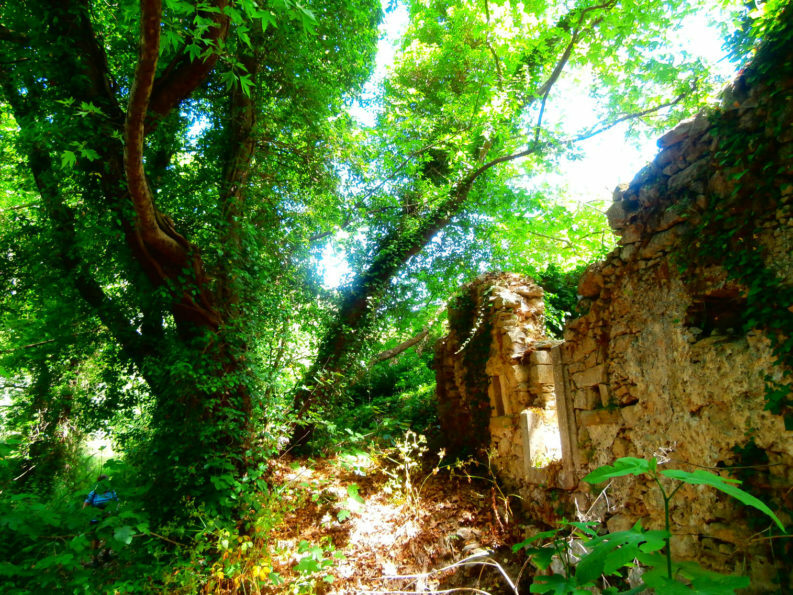 You will also pass a small church called Agios Ioannis. At the end of the route you get a stunning view of the landscape and the sea. Katholiko Gorge: A difficult 2,5 hour hike, available from April to November. This stretch starts in Gouverneto and ends at sea. Not suited for children. 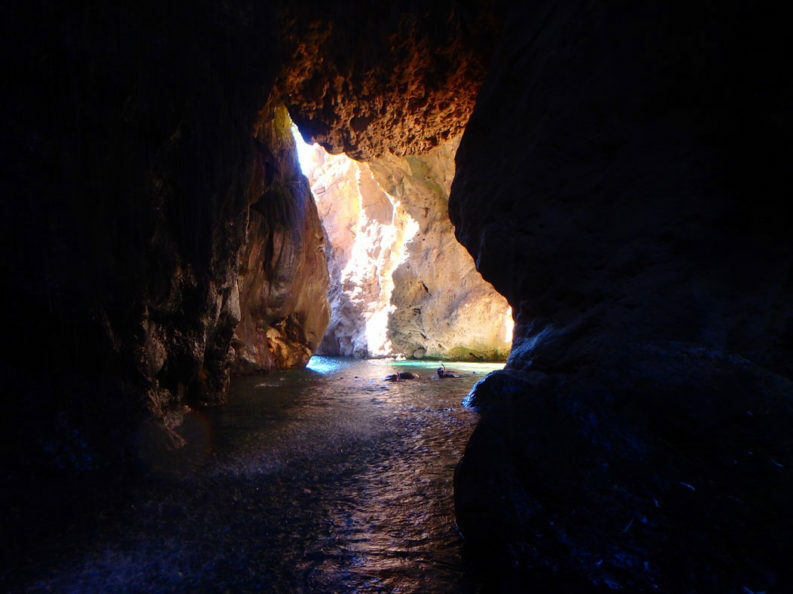 During this hike you can visit the cave of Panagia Arkoudiotissa. Translated literally this means the Bear Cave. The name comes from the large central stalagmite in the form of a bear that is ready to drink water. According to legend, the Virgin Mary turned the bear that was stealing the water of the monks living nearby into stone. Along the way you will also come across the monastery Katholiko, which is quite spectacular. 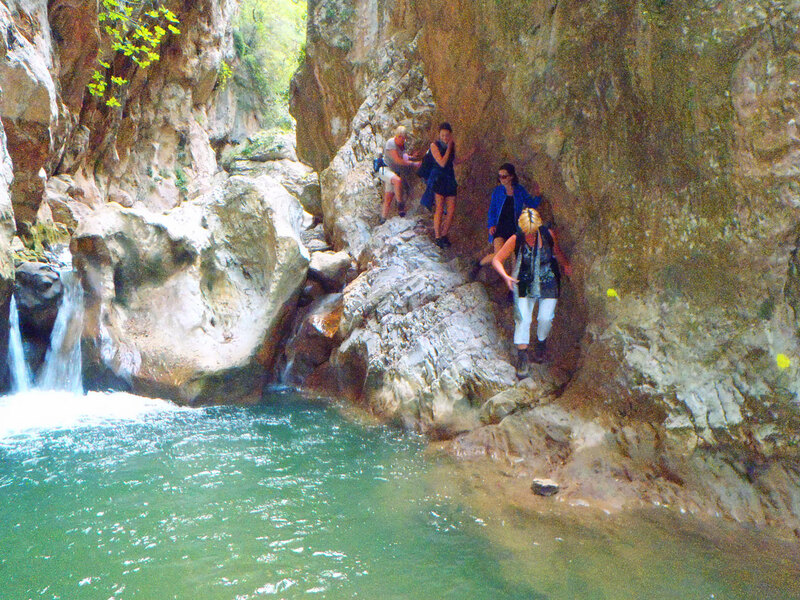 Patsos gorge or Saint Anthony’s Gorge: A very challenging 3 – 4 hour hike, available from April to November. This hike starts at the church of Agios Antionos and ends in Potami. Not suited for children. 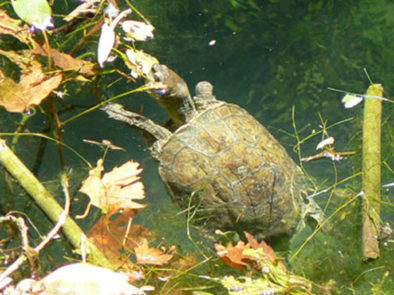 This excursion has a lot of flora and fauna along the way, as well as several archeological spots. The fun part this day is that you have to walk over wooden stairs along the way, so you can climb up on the rocks. 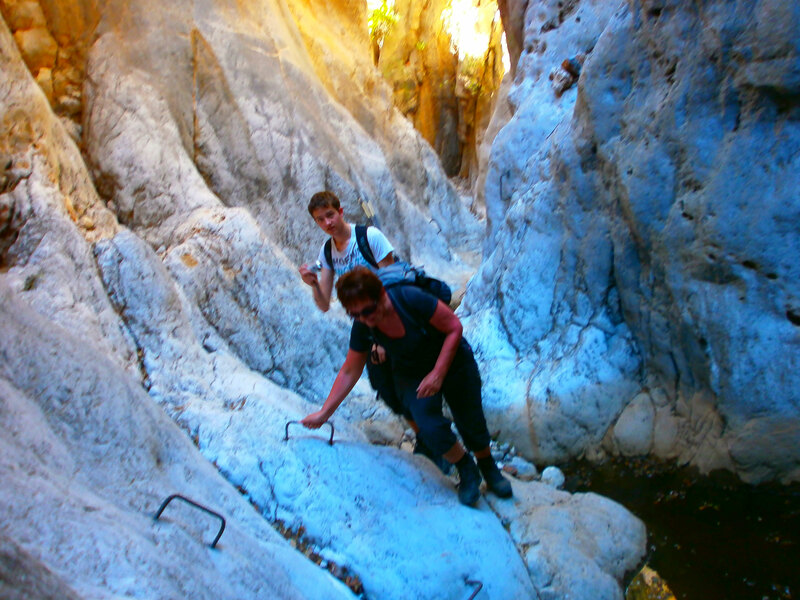 Rouvas Gorge: A very challenging 5 hour hike, available from April to November. This stretch starts lake Votomos and ends in Rouvas forest. Not suited for children. 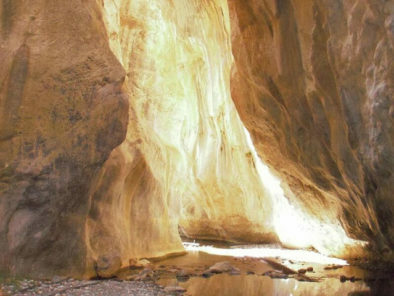 This gorge is also known as the Saint Nicholas Canyon. At the beginning of the walk you come across a lake, which is a fresh water lake, very rare on Crete. A little bit further you see the first object; the monastery of Agios Nikolaos. There is a lot to be seen along the way; you cross bridges for example and you will see a waterfall. Agiofarango Gorge: An easy 2,5 hour hike, available from April to November. This stretch starts at the Odigitria Monastery and ends at sea. Suited for all ages. Along the way you will see spectacular rock formations, alongside which you can often see mountain climbers dangling. You end the tour at the sea where it is great to go for snorkelling. 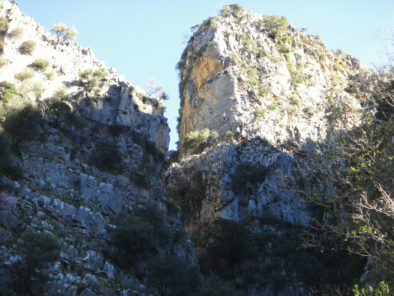 Rozas Gorge: A fairly easy hike with some challenging parts, available from April to November. This stretch starts in Gonies and ends in Kera. Not suited for children. This is a tour with many high rock walls and large rocks, which means lots of climbing. You will be a lot in the sun, but sometimes you have shadow for a while from the large rock walls we pass along the way. 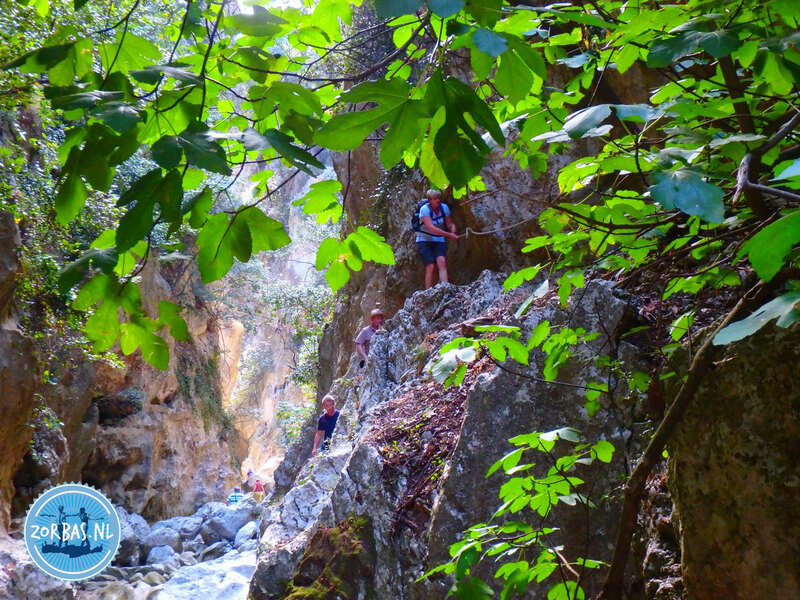 Kritsa Gorge: An easy 2,5 hour hike, available all year round. 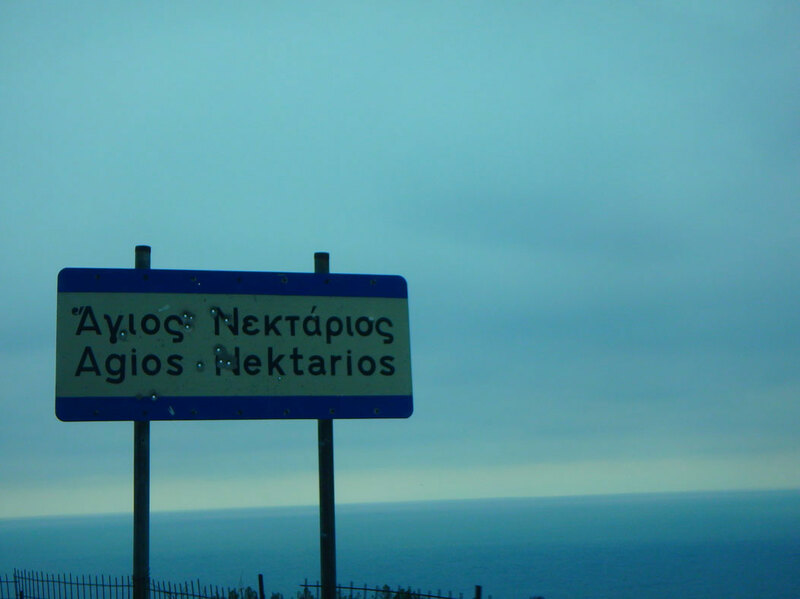 This stretch starts in Kritsa and ends at Katharo Tsivi Mountain. Suited for all ages. 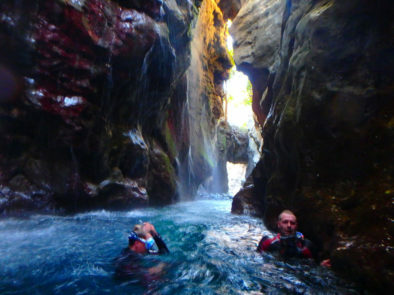 During this excursion you will actually go through a river that has worn out rock walls on its side. These rock wall surfaces have become smooth because of the water passing through the years. A fun excursion for the whole family. 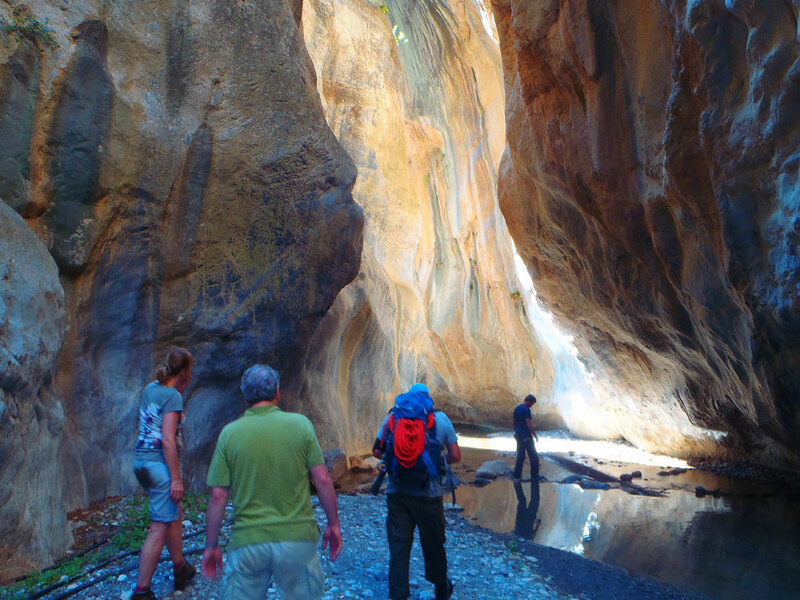 Sarakina Gorge: An easy 3 hour hike with some challenging parts, available all year round. This stretch starts in Mithi and ends between Hristos and Mithi. Suited for children from the age of 12. During this trip you will come across many rocks you will have to climb over. In spring and autumn you have to walk now and then through the river and little streams and sometimes you even have to swim. During the summer months there still flows a little stream. Orino Gorge: An easy 4 hour hike, available from April to November. 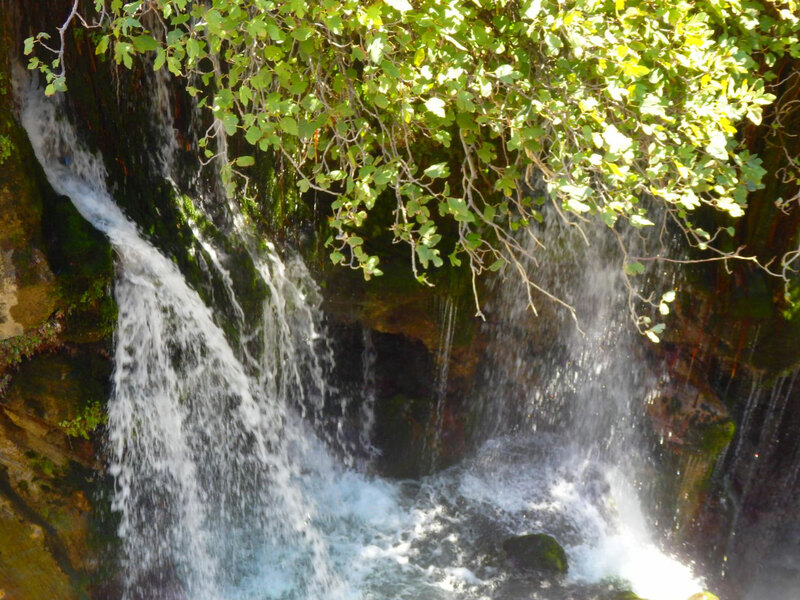 This walk starts in Koutsouras Park and ends in Orino. Suited for all ages. 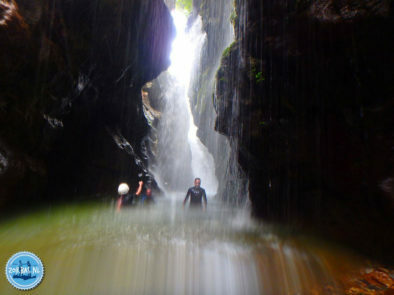 A tour that takes you alongside a small river with several small waterfalls. Along the way there are quite a few parts where you must climb a bit by means of wooden ladders and bridges. You will be walking in the sun a lot during this tour. 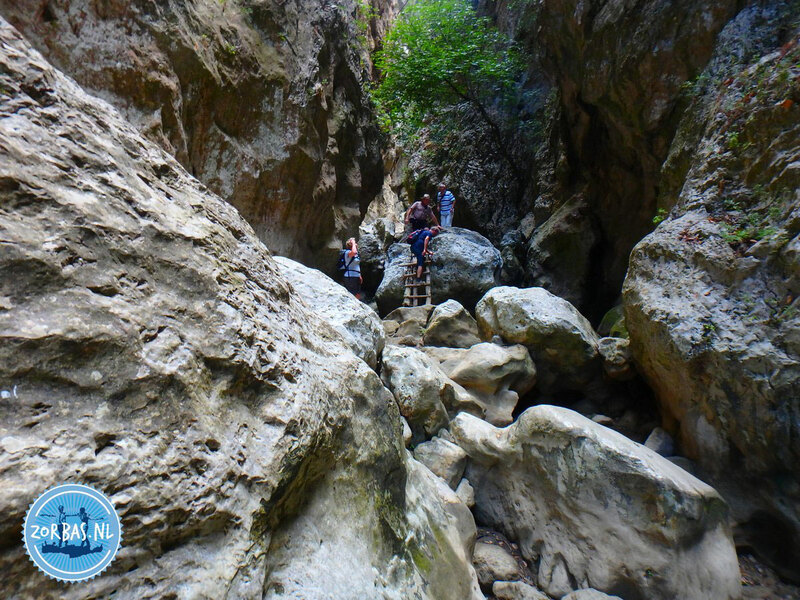 Pefki Gorge: An easy 2 – 3 hour hike with some challenging parts, available from April to November. This 7 kilometres walk starts in Pefki and ends at sea. Not suited for children. There is beautiful nature in this area, with many trees and other kinds of vegetation along the way. You will also pass many small streams, with fresh water flowing towards the sea. 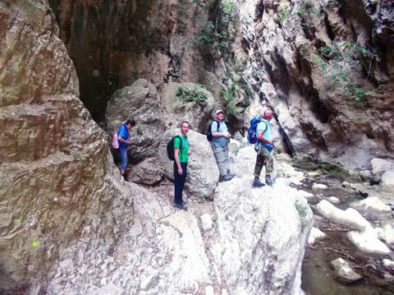 Zakros Gorge: An easy 3 hour hike, available from April to November. You start walking in Zakros and end up in Kato Zakros at sea. Suited for all ages. A fun jungle tour alongside a small streaming river. 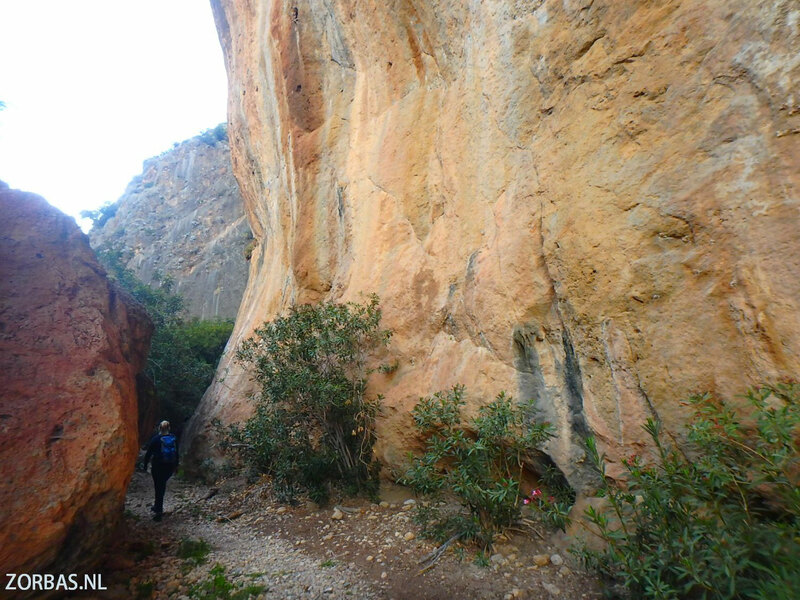 Along the way you will pass several rock walls with various types of rocks, and you will see many species of flora and fauna as well. 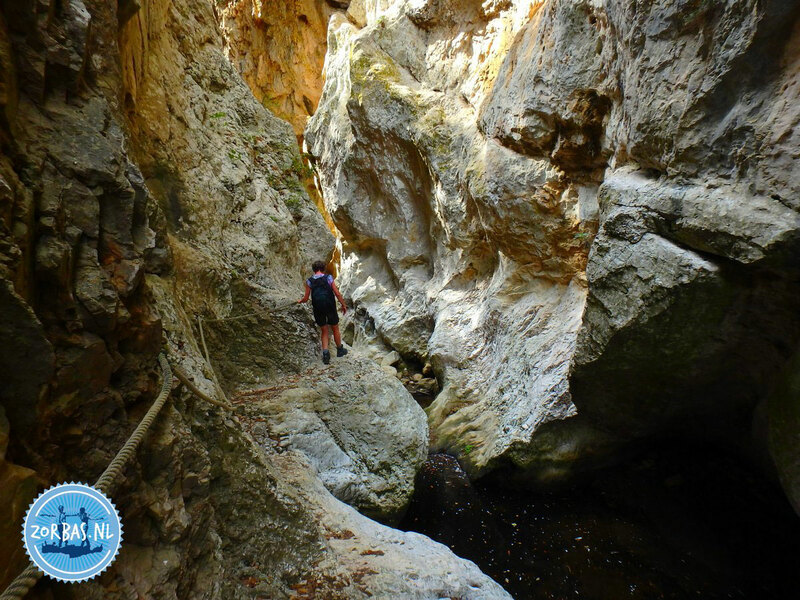 Hohlakies Gorge: An easy 3 hour hike, available from April to November. It starts in Hohlakies and ends in Karoumas Bay at sea. Suited for all ages. At the beginning of this excursion you will be surrounded by high rock walls and large rocks. You will have to pass some narrow passages. Once you have reached the end of the tour, you will find yourself alongside the sea, where you first reach a large open area from where you will have a spectacular view. Richtis Waterfall: An easy 2 hour walk, available all year round. 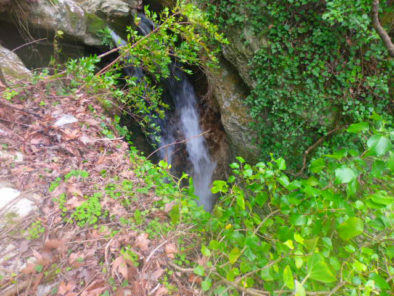 This stretch starts in Tigania and ends at the waterfalls of Richtis. Suited for all ages. 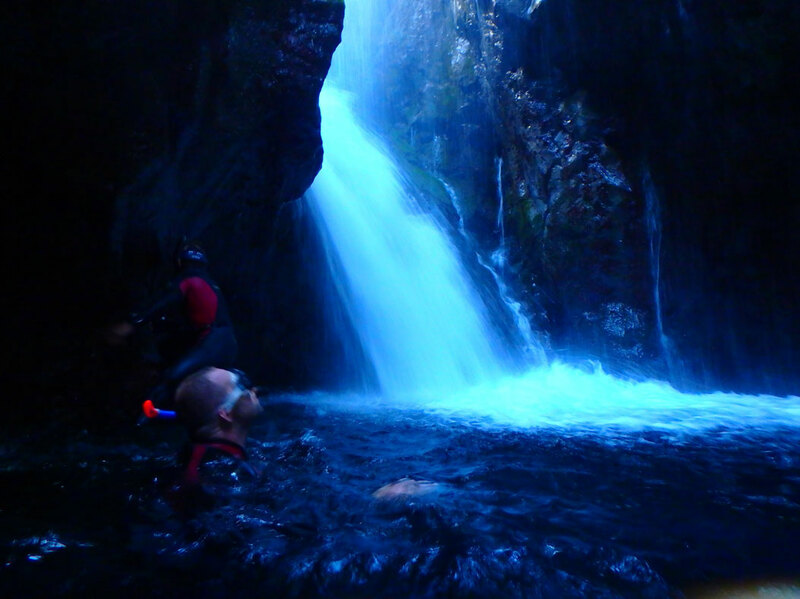 The name of this tour already indicates that you come across waterfalls along the way. It is mainly a jungle tour, with many kinds of trees and plants. You start at the sea side with a very nice view of the sea. 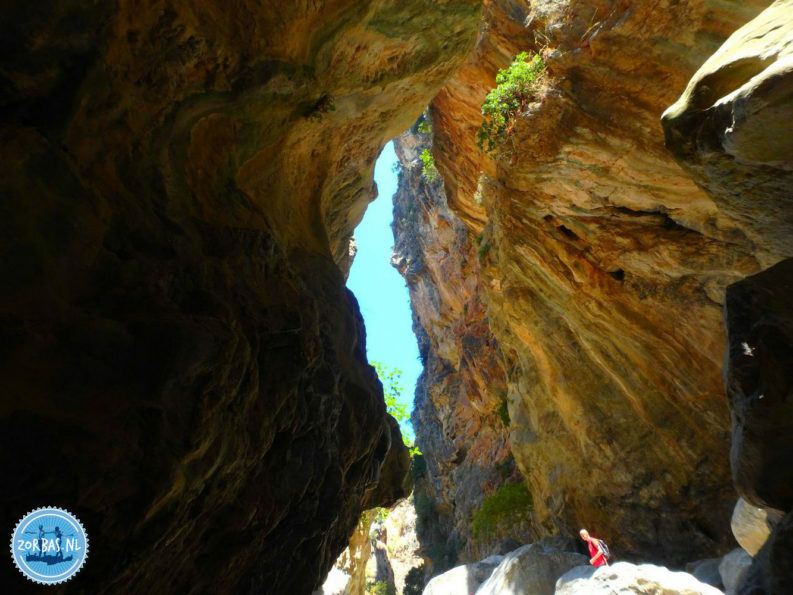 Pervolakia Gorge: A relatively challenging 2 hour hike, available from April to November. This 3,5 kilometres hike starts near the Kaspa Monastery and ends in Pervolakia. Suited for children from the age of 12. A tour with many fun little hills that you will need to climb and descend. Along the way there is not much shadow and it is very dry, but it is close to the sea so usually there is a bit of a breeze. On the hill side of the pasture mountain: A relatively challenging 3,5 – 4,5 hour hike, available any time of year. This 10 kilometres stretch starts at Therisso and ends in Meskla. Suited for children from the age of 12. 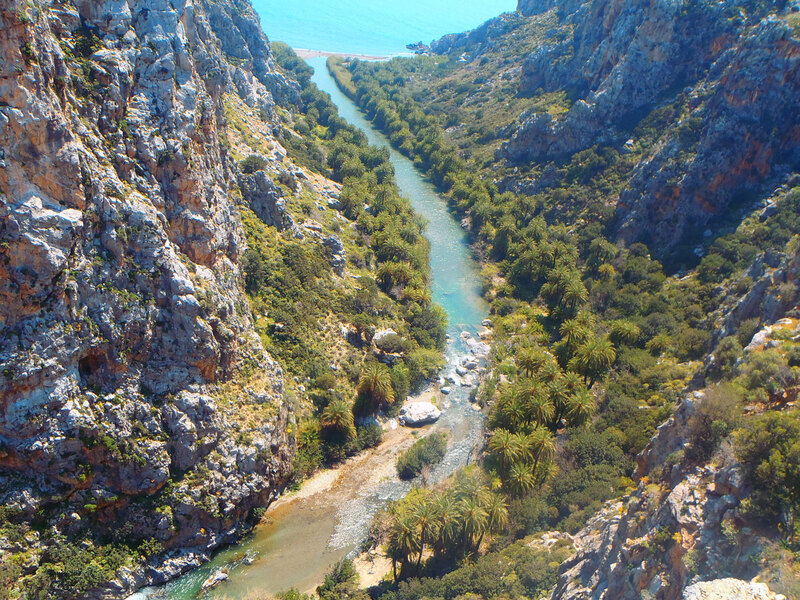 The valleys near Zourva and Meskla belong to the biggest wetland areas of Crete. Therisso has two museums that will be interesting for people engaged in the history of the Turkish and German occupation. From village to village: An easy 3 – 4 hour hike, available any time of year. 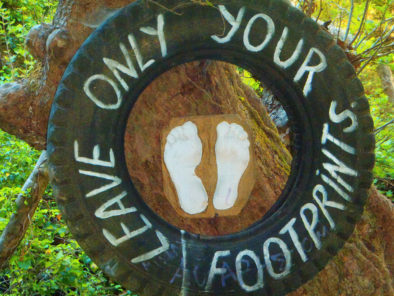 This 12 kilometres walk starts and ends in Douliana. Suited for all ages. During this excursion the landscape is decorated by olive gardens, vineyards and cypress forests. The small villages are still quiet and have kept their authenticity. 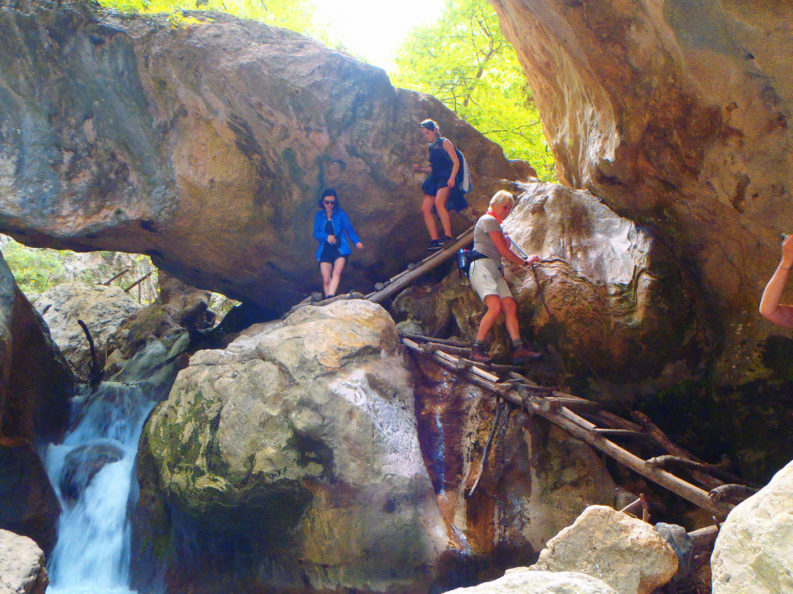 Drapanos: A relatively challenging 4 – 5 hour hike, available any time of year. This 14 kilometres stretch starts at Georgeoupolis and ends in Gavalochori. Not suited for children. A walk from village to village, starting at the coast and leading inland on the Peninsula Apokoronas. 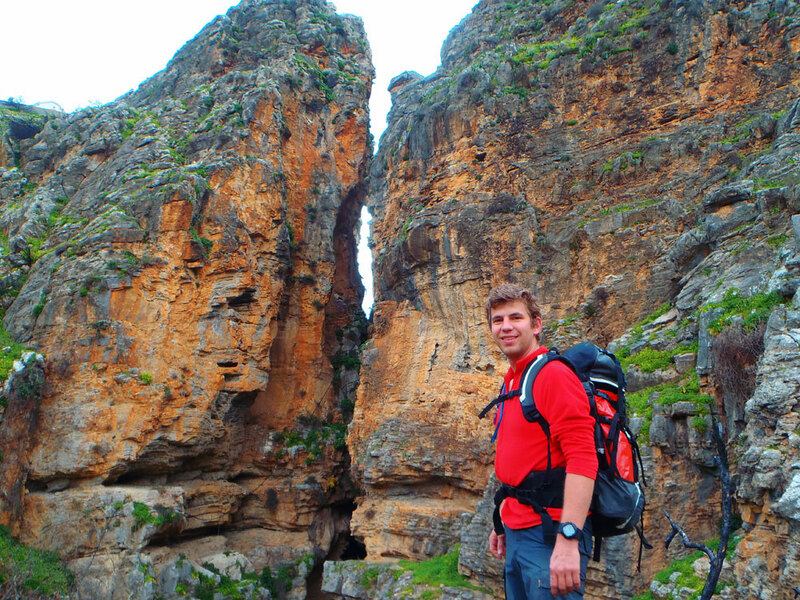 The fresh water lake Kournas: A relatively challenging 4 – 5 hour hike, available any time of year. 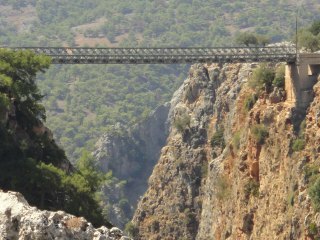 This 12 kilometres stretch starts at the Krapis Plateau and ends at the Kournas lake. Not suited for children. 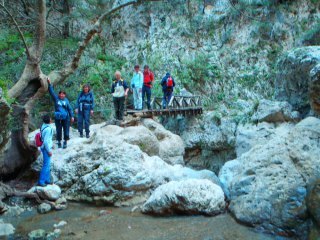 This hike is a typical Cretan high level hike. There is also the option to travel from the South coast to Alikambros on a donkey. The goal of the trip is of course the Kournas Lake. The old connection road: A very challenging 5 – 6 hour hike, available any time of year. 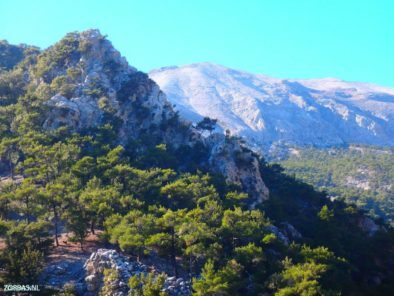 This 10 kilometres hike starts at Lakki and ends in Omalos. Not suited for children. After the mountain village of Lakki, the route takes us on a small herders path through a gorge and a valley with a steep climb. After a climb of 700 meters you can reward yourself in a traditional tavern at Omalos. The uninhabited peninsula: A very challenging 5 – 6 hour hike, available any time of year. This 18 kilometres walk starts and ends in Rodopos. Not suited for children. 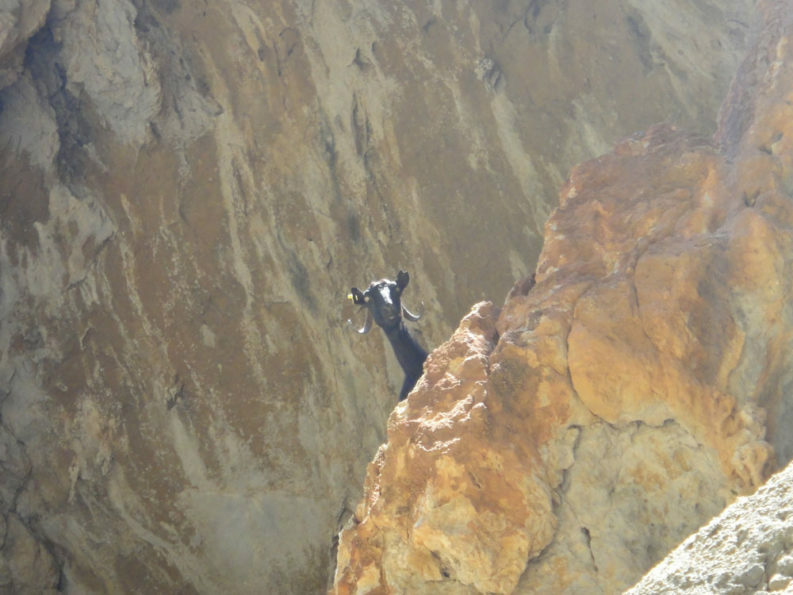 The hike leads through a dry landscape, inhabited by many goats and sheep. The charm of the walk are the stunning views over land and sea. The Strawberry Forest: A challenging 2,5 – 3,5 hour hike, available any time of year. This 9 kilometres stretch starts at Sassalos and ends in Aligi. Suited for children from the age of 12. Over enchanting little paths through a valley, a strawberry forest and moorland alongside a stream, which has water all year round. Nisi Gorge: A very challenging 6,5 hour hike, available all year round. This walk of 17 kilometres starts and ends in Koutsamatados. Not suited for children. Besides the Topolia canyon this hike also goes through another less known gorge. During this walk you have nice views of the mountainous landscape. The Enchanted Village: A challenging 3,5 hour hike, available any time of year. 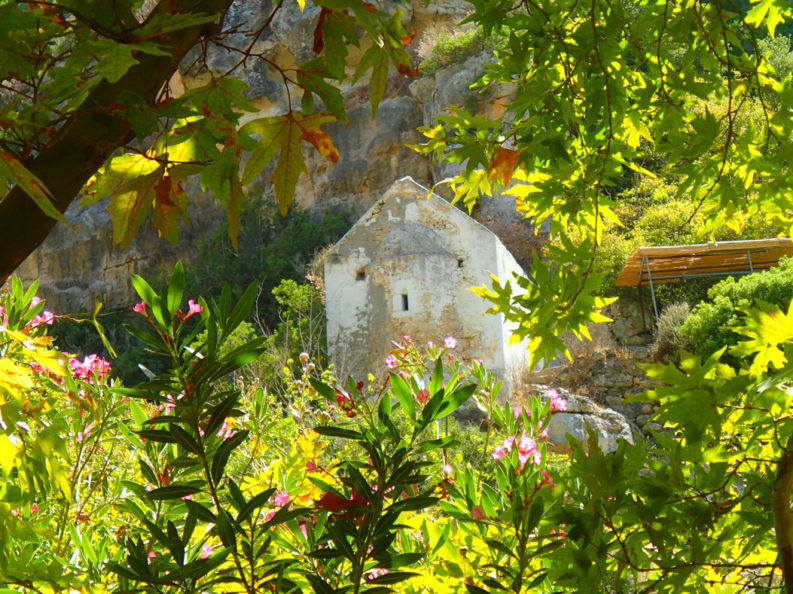 This 9 kilometres walk starts and ends in Milia. Suited for children from the age of 12. 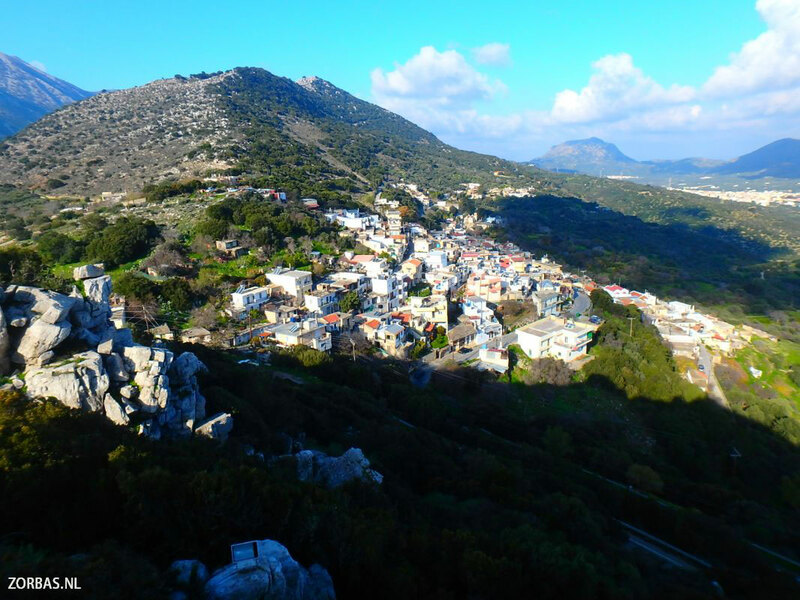 The valley of Milia belongs to the most remote areas of Crete. 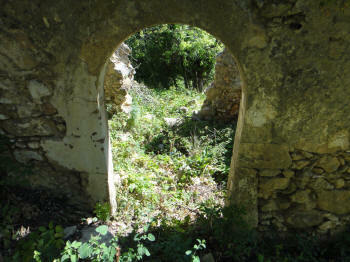 In the Second World War it was here that the Cretans could escape their occupiers. The village was deserted after a plague epidemy in 1700. Now it is inhabited again and there is even a hotel. 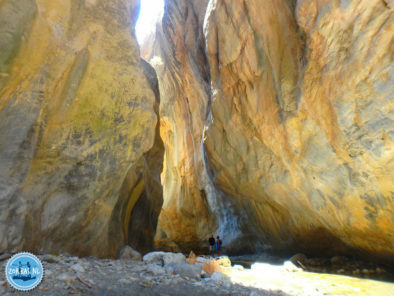 Tsichliana Gorge: A challenging 5 hour hike, available from April to November. 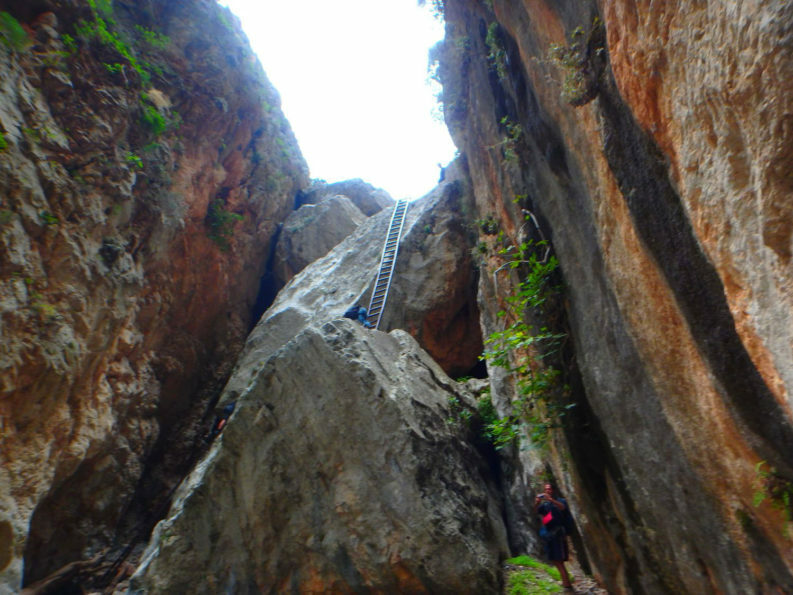 This hike of 14 kilometres starts in Sirikari and ends in Polyrinia. Not suited for children. From the remote Sirikari village you go through a gorge towards Polyrinia, which is located on the Akropolis hill towards the ancient village of Polyrinia. The climb will be rewarded with a view of the North and West coast. At the Rock Grave: A rather challenging 2,5 – 3,5 hour hike, available any time of year. This 9 kilometres stretch starts in Kontokinigi and ends in Paleochora. Not suited for children. The path offers glorious views of two river valleys. During the hike you will find the old rock grave of an unknown fisherman. The tour ends with a relaxed walk down through a green valley. 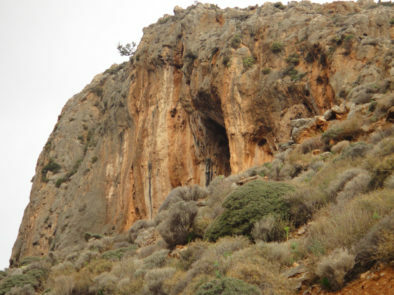 The Cave of the 99 Fathers: A rather challenging 3,5 hour hike, available all year round. This 11 kilometres stretch starts in Kalamos and ends in Azogires. Not suited for children. 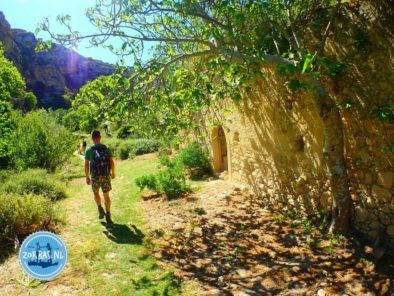 A large part of the walking trip takes you on a charming footpath alongside ridges, through olive gardens and meadow lands. One goal is the cave; the other goal is the quiet mountain village Azogires in the wetlands which is surrounded by olive fields. Two stunning mountain villages: A rather challenging 4,5 hour hike, available any time of year. This 11 kilometres stretch starts at Paleochora and ends in Azogires. Not suited for children. From the beach of Anidri the tour goes through a canyon towards the village of Anidri. 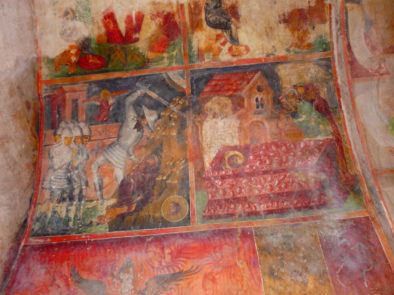 Here you can find the church of St. George, where the frescos from the 14th century have been kept in relatively good shape. After this the route goes over a well shaded path on a ledge to a cave monastery in the mountain village Azogires. 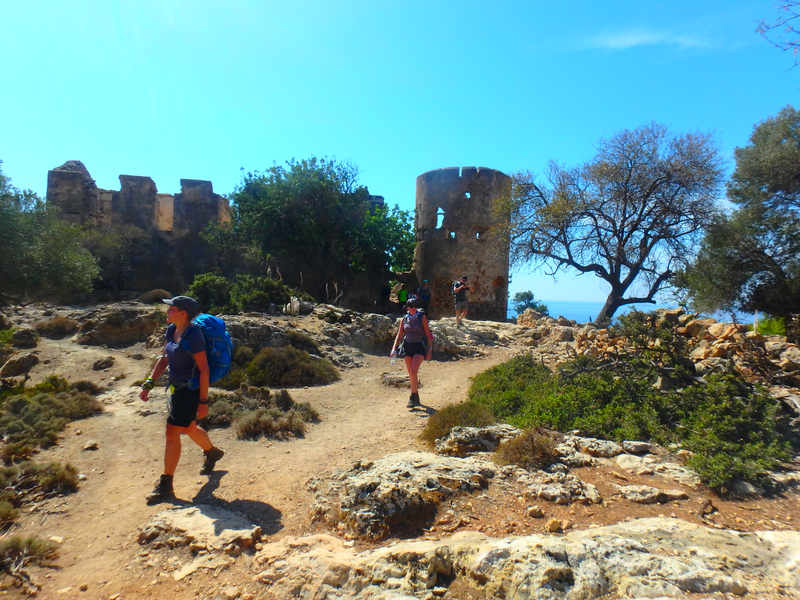 In the tracks of antiquity: A rather challenging 6 hour hike, available all year round. This 15 kilometres hike starts in Paleochora and ends in Sougia. Not suited for children. 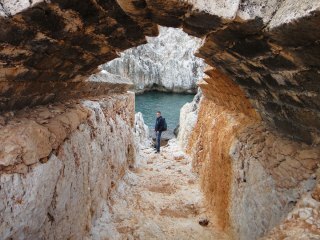 Along the deserted and undeveloped South coast the route passes cliffs and inlets alongside the ancient revalidation and spa area of Lissos. Lissos is situated in a deserted valley, which nowadays can only be reached by foot or by boat. 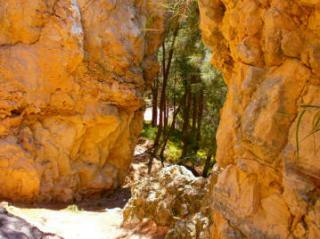 Near the end of the hike you will go through a gorge, which is filled with pine trees. 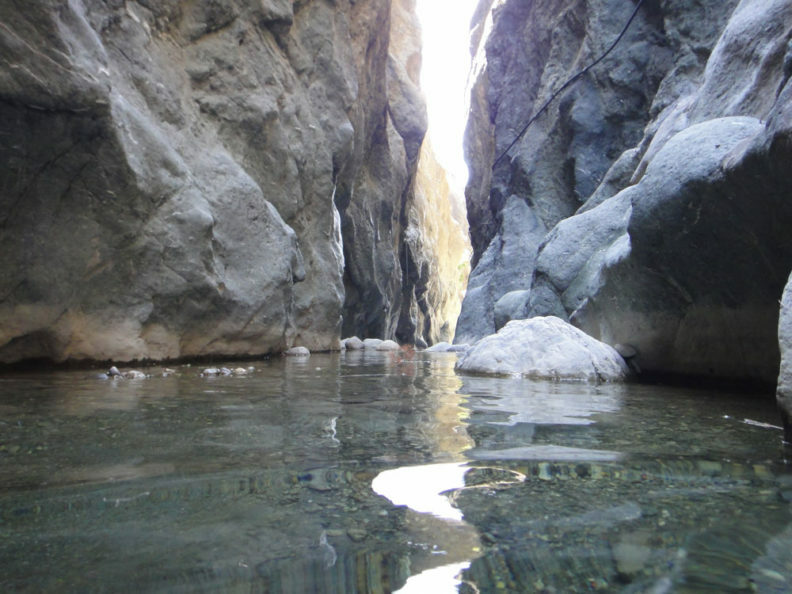 Agia Irini gorge: An easy 5 hour hike, available from April to November. This 12 kilometres stretch starts in Epanochori and ends in Sougia. Suited for children from the age of 12. The deep gap of the Agia Irini Gorge divides the countryside of Selino from the massive white mountains, which are located on the east side of the gorge. 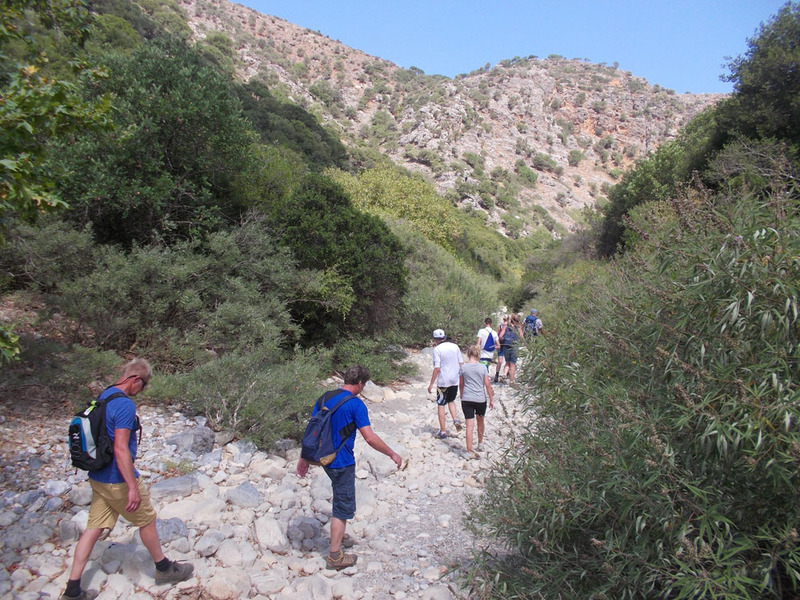 The hike is only half as long as the Samaria Gorge, but comes in a good second. Koustogerako: A very challenging 5,5 hour hike, available any time of year. This 14 kilometres stretch starts in Rande and ends in Koustogerako. Not suited for children. 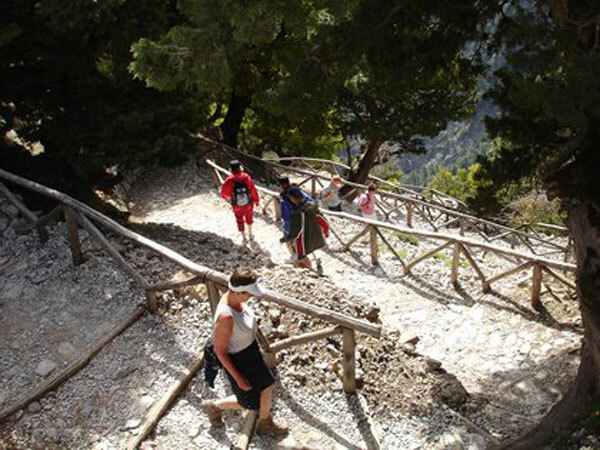 This walk goes through forests with cypress trees, oaks and pine trees, and provides you with the most beautiful panoramic views. Over the mountains of the Selino district you will reach the isolated mountain village of Koustogerako. 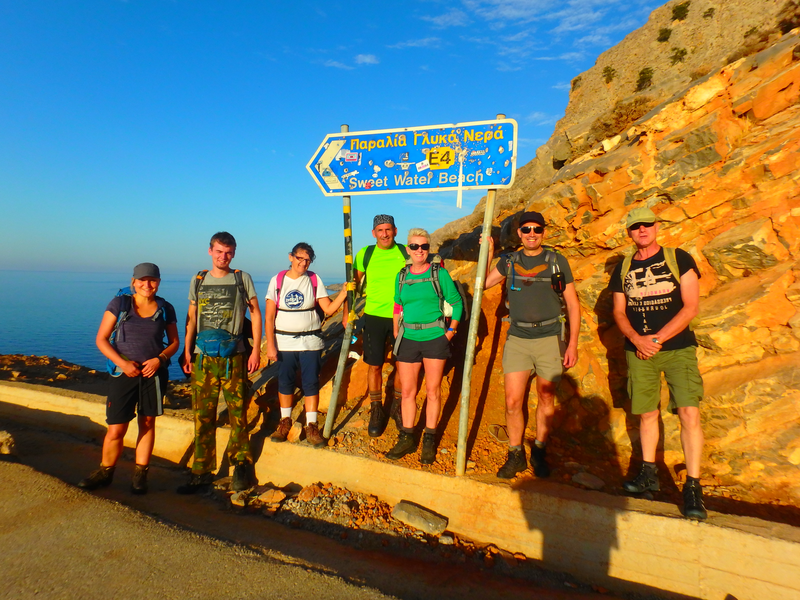 Cliffs of the South Coast : A very challenging 5 – 6 hour hike, available all year round. 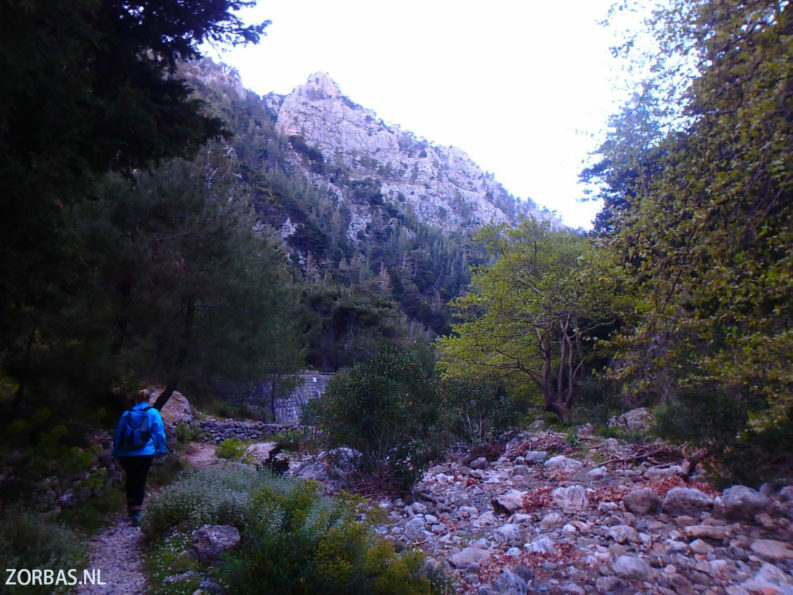 This 17 kilometres hike starts in Sougia and ends in Koustogerako. Not suited for children. This tour on both paths and roads offers lovely views of the villages at Selino and the wild undeveloped South coast. Very interesting is the part at Cape Tripiti and the church of Saint Antonios. 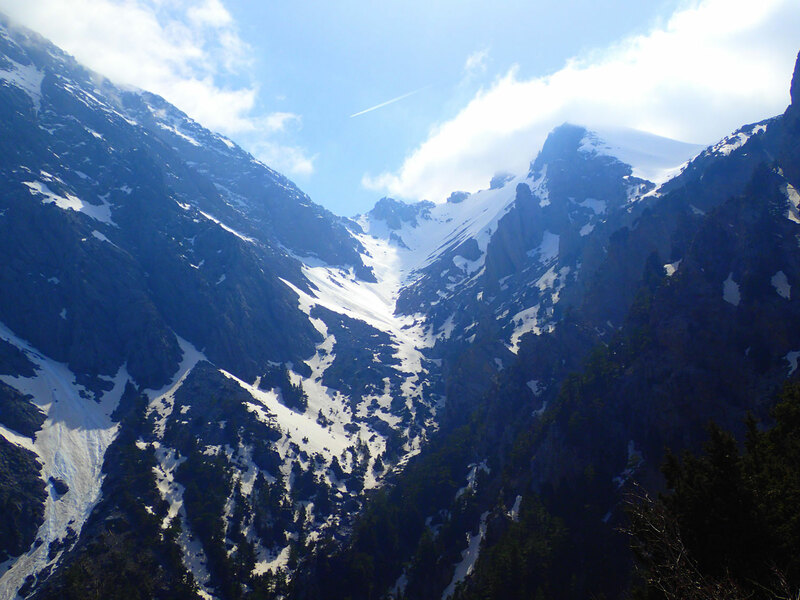 Mountaintops Tour 1: A very challenging 6 hour hike, available from April to November. This 13 kilometres stretch starts at the Plateau of Omalos and ends in Gingilos. Not suited for children. The grey rock boulders that have built themselves up above the field of Xiloskalo, are called Gingilos. The hike passes over several mountain tops. 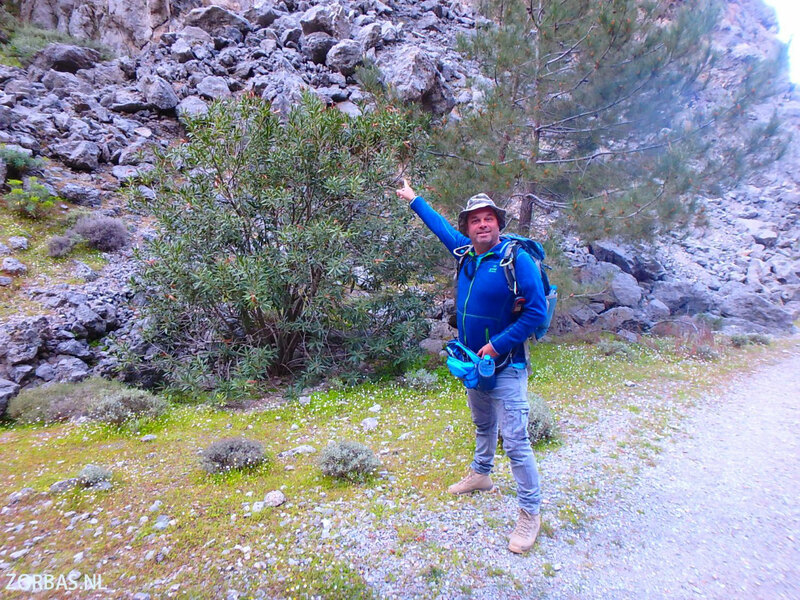 A for Cretan standards favorite mountain tour with a lot of climbing involved. 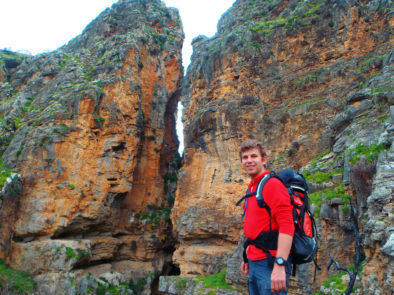 Mountaintops Tour 2: A very challenging 7,5 – 8,5 hour hike is possible from April to November. This 22 kilometres stretch starts at the Omalos Plateau and ends in Melidaou. Not suited for children. This extraordinary spectacular hike passes a hut which is standing right on the edge of the canyon. Then the hike continues through the fiels in the mountains. There will be a lot of climbing and passing of very narrow paths involved. The highlight of the day is the delicate stroll on the edge of the Samaria Gorge. 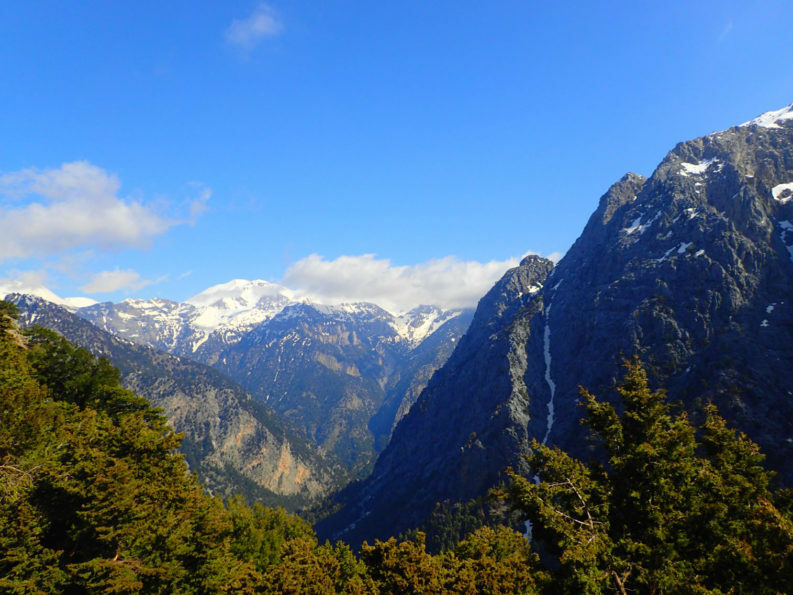 Samaria Gorge: It is not an easy walk of 5 – 6 hours and only possible from May to October. 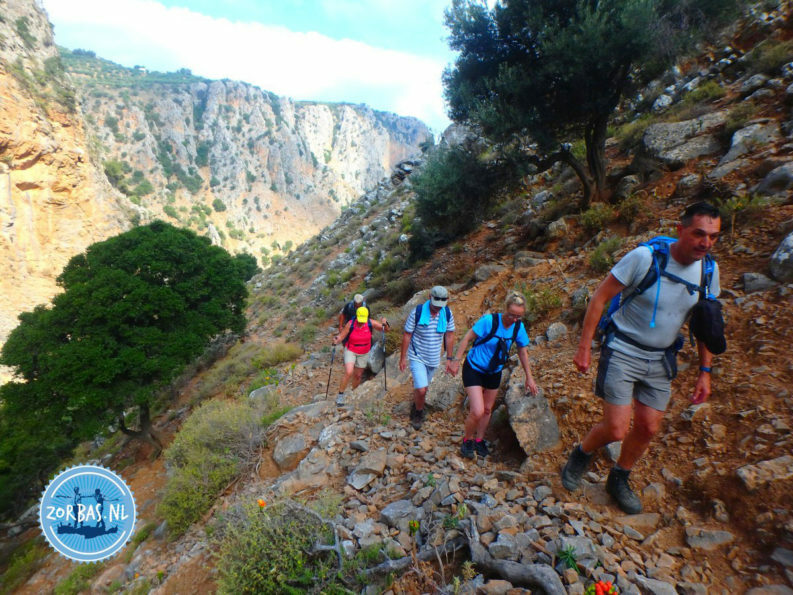 This 16 kilometres hike starts in Xiloskalo and ends in Agia Roumeli. Suited for children from the age of 12. 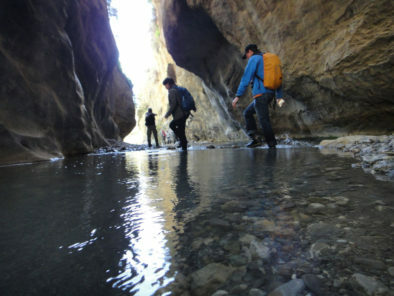 Highlight of an active holiday on Crete, is the hike through the Samaria gorge, which is located in the national park. Samaria is the original habitat of the unique Cretan goat; the Kri-Kri. Along the South Coast: A rather challenging 5 hour hike, available any time of year. 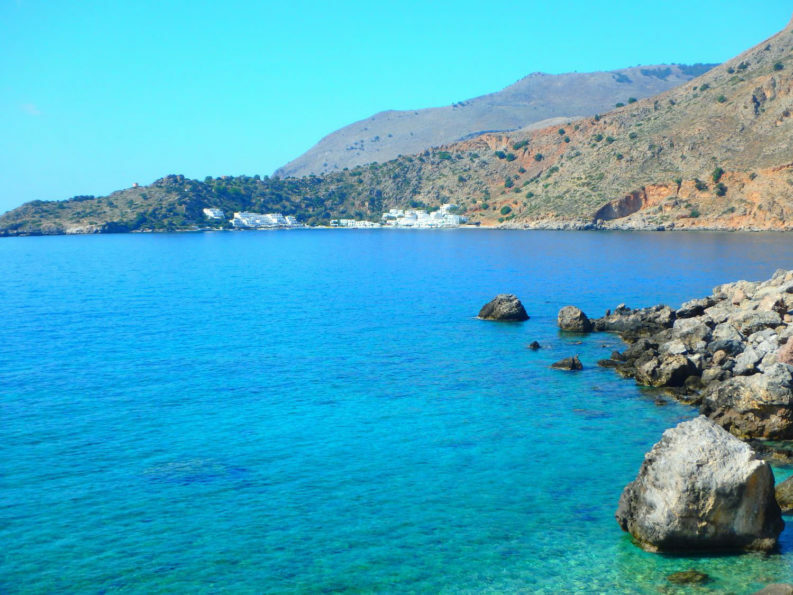 This 15 kilometres stretch starts in Loutro and ends in Agia Roumeli. Not suited for children. 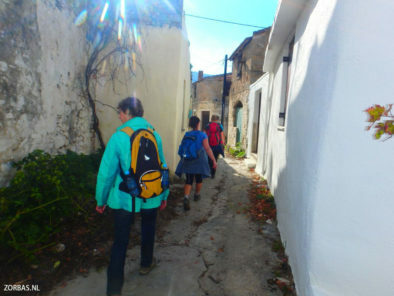 The walk follows the coastline along the old connecting road from Agia Roumeli to Hora Sfakion. 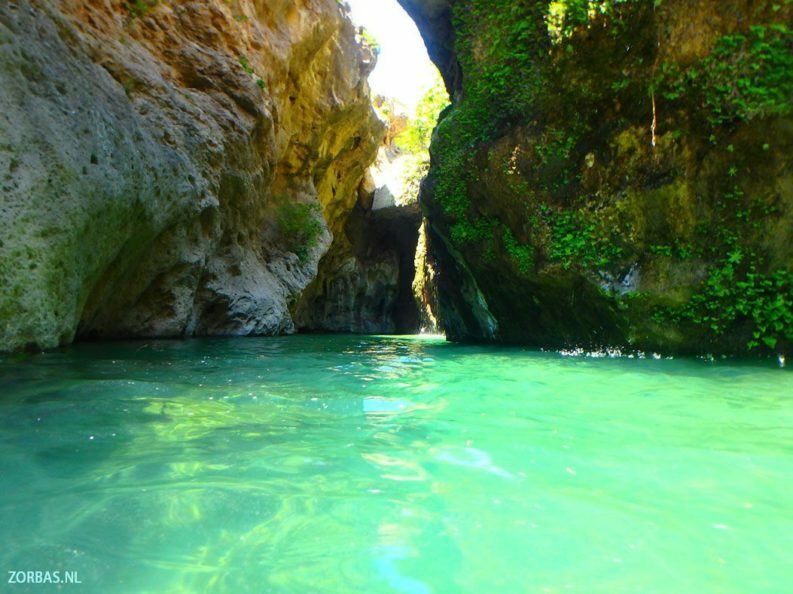 You will find small bays with beautiful beaches and crystal clear water. Deep gorges and steep slopes: A very challenging 6 – 7 hour hike, available from April to November. 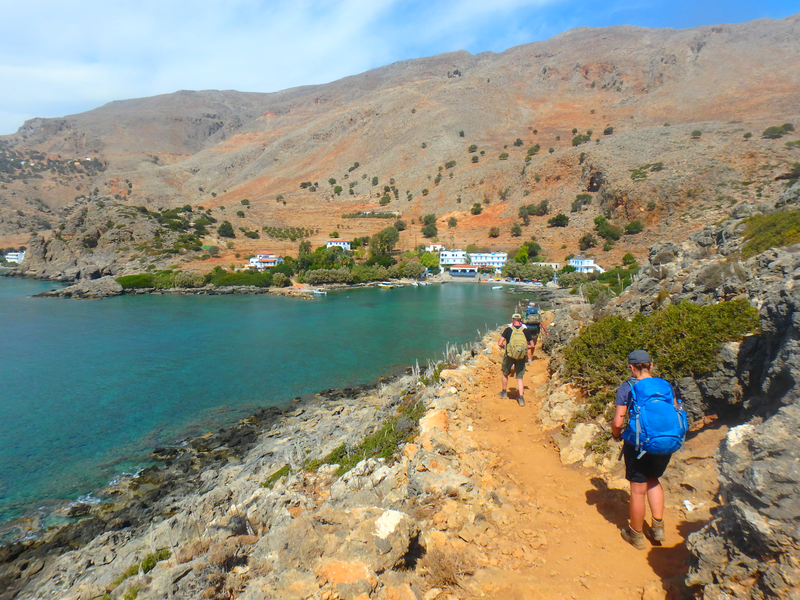 This 20 kilometres hike starts and ends in Loutro. Not suited for children. Through the Aradena gorge the hike goes up towards the Anopolis mountains and through the once abandoned village Aradena. 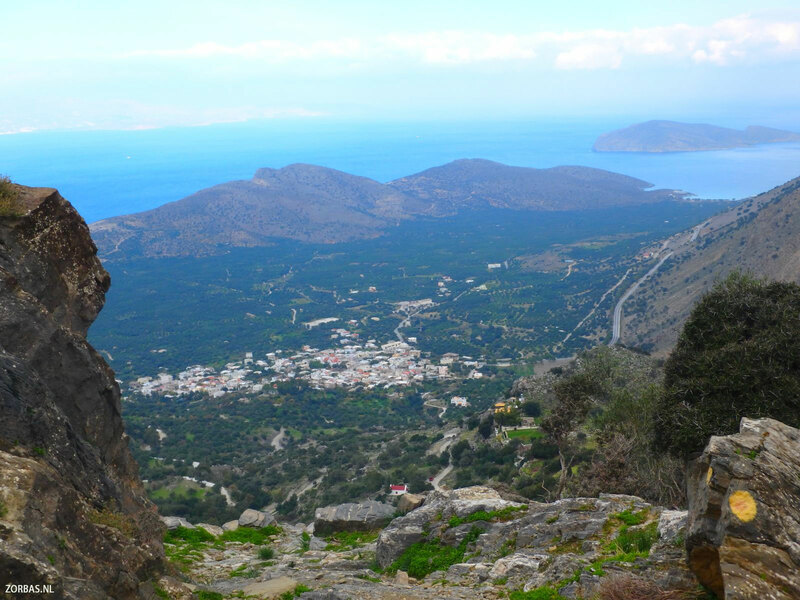 The descent to Loutro offers beautiful views of the Libyan Sea. 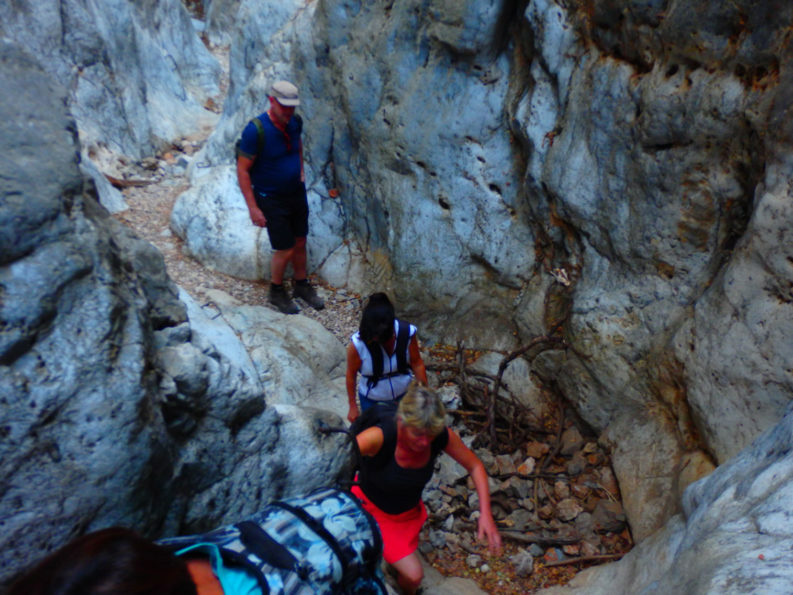 In the heart of Sfakia: A rather challenging 5 hour hike, available from April to November. This 10 kilometres stretch starts in Anopolis and ends in Chora Sfakion. Suited for children from the age of 12. To the south of the mountains, 600 meters above sea level, is the Anopolis plateau with small farms around. The return walk is alongside the cliffs. Nektarios-Kallikrates Canyon: A very challenging 7,5 – 8,5 hour hike, available from April to November. 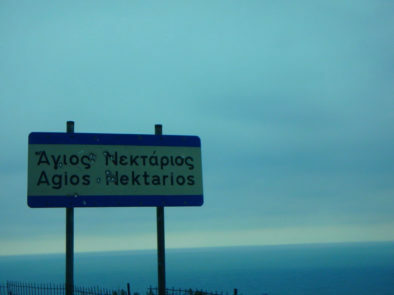 This 19 kilometres stretch starts and ends in Agios Nektarios. Not suited for children. The path leads from the Askifou mountains to the south coast and not through the Imbros Gorge. This path is rarely used for hikes. 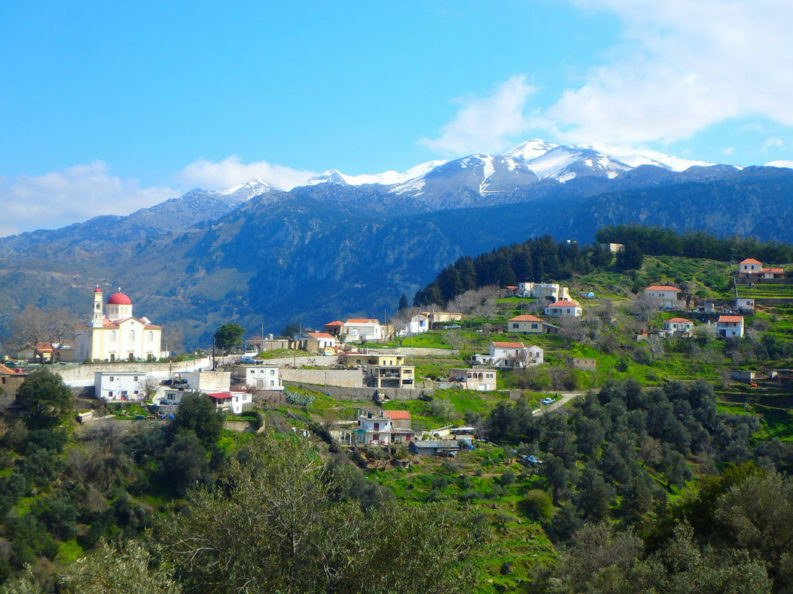 The Village Argyroupoli: A rather challenging 4 hour hike, available any time of year. This 11 kilometres stretch starts and ends in Argyroupoli. Suited for children from the age of 12. 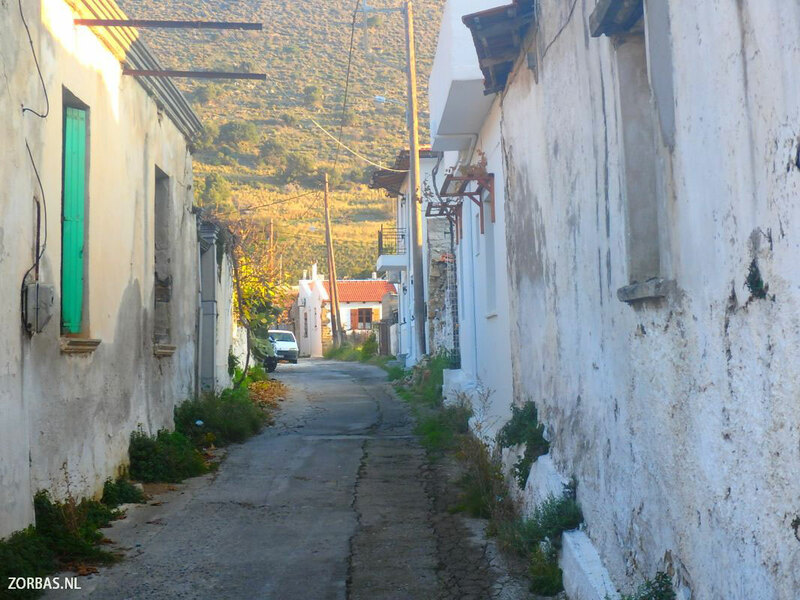 This tour takes you through the lovely village of Argyroupoli . It is located on a mountain on the ruins of the ancient city of Lappa. The caves underneath the village still contain water. One can hear the soft trickling of the water into the surrounding streams all day. The Valley of the Mills: An easy 4 hour hike, available all year round. This 9 kilometres stretch starts and ends in Xirochorio. Suited for all ages. A nice tour where you will also encounter the village of Chromonastiri. Along the way you will come across various little churches that are worth a visit. 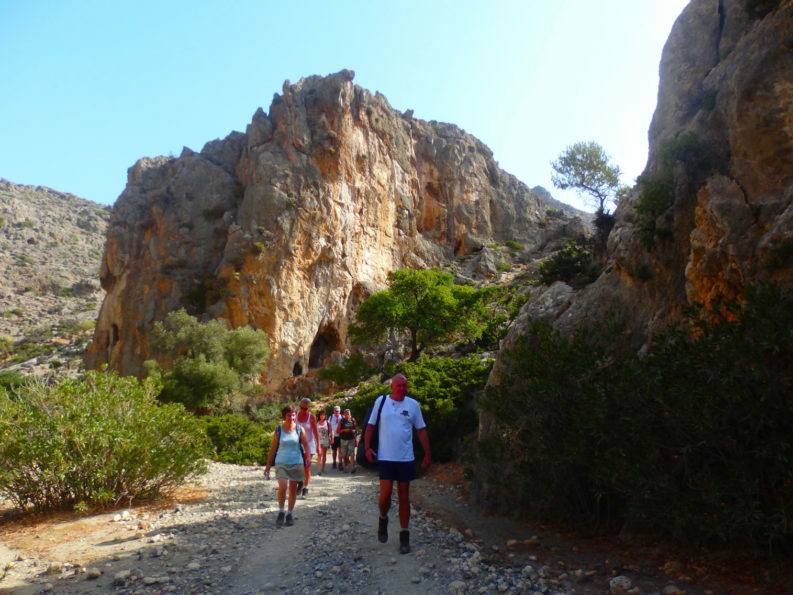 On the slope of Kedros mountain: A very challenging 4 – 5 hour hike, available any time of year. This 14 kilometres stretch starts and ends in Ano Meros. Not suited for children. At the beginning of this hike you will immediately start to make a climb. This takes two hours and goes gradually up. After this hike you will go back down, only along a different route. Along the way you come across the Kaloeidena monastery, which you can visit. 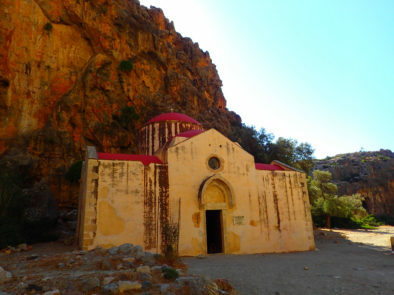 Nice landscapes and monasteries: An easy 2,5 hour hike, available any time of year. 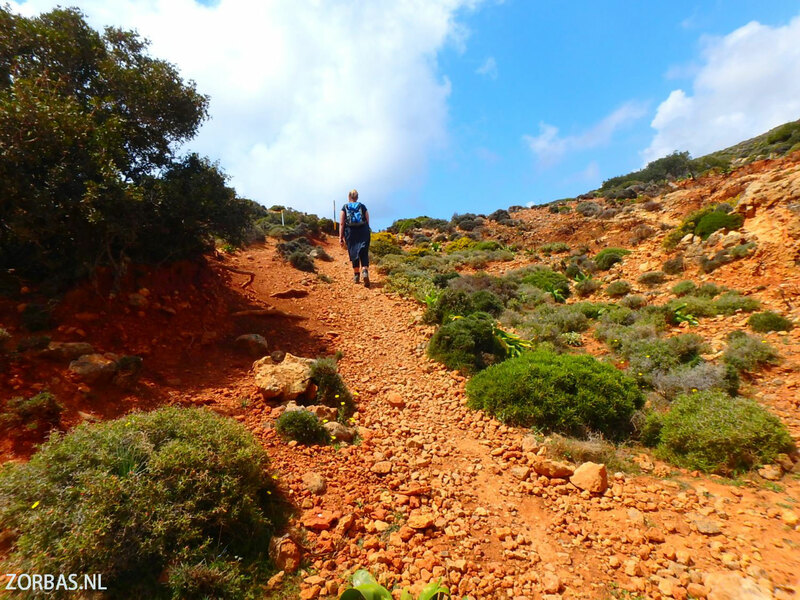 This 9 kilometres walk starts in Arkadi and ends in Amnatos. Suited for all ages. A nice hike during which you will come across several little villages and monasteries. It is a hike where you make your way downhill most of the time. During this hike you really are walking in between the mountains. Skalopatia East: A slightly challenging hike, available all year round. Suited for adults and children from 12 years and up. The walk starts at the village Peza and ends on the road from Aitania to Skalani. The time needed is about 6 hours, but also depending which of the many options are taken: we can walk here 8, 10, 12, 15 or 20 kilometres. This is a hike through a jungle-like area with a varying nature along the river. This hike has less shadow than in Skalopatia West, but is even in the summer months nice to do. 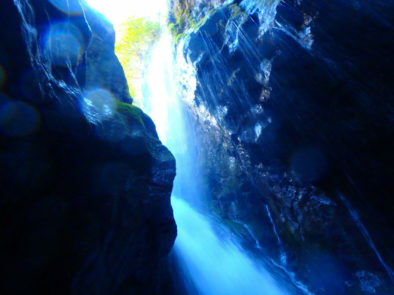 Skalopatia West: An easy walk through nature of about 7 kilometres and possible all year round. Suited for children with the age of 8 years and up. The walk starts in Mirtia and ends on the road from Aitania to Skalani. The walking time will be about 5 hours. The nature in this area is never boring. At the beginning of the gorge the river alsways has water. 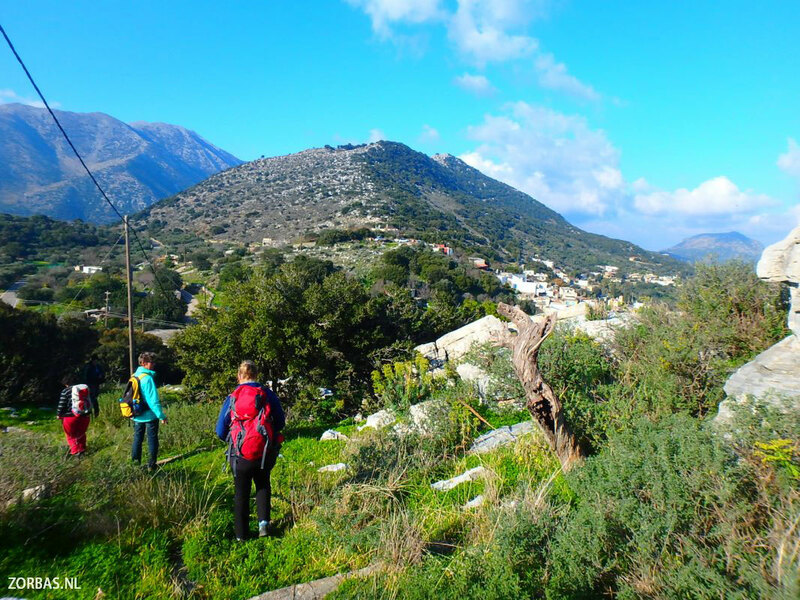 Walking on Crete: Information about walking & hiking on Crete. 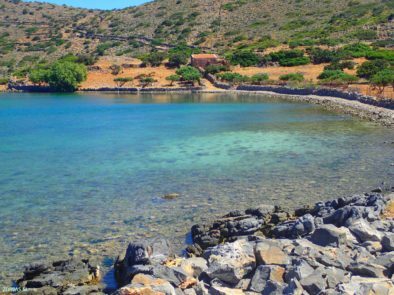 Our accommodation is situated directly by the sea and is the ideal starting point for walks all over Crete, both summer and winter. 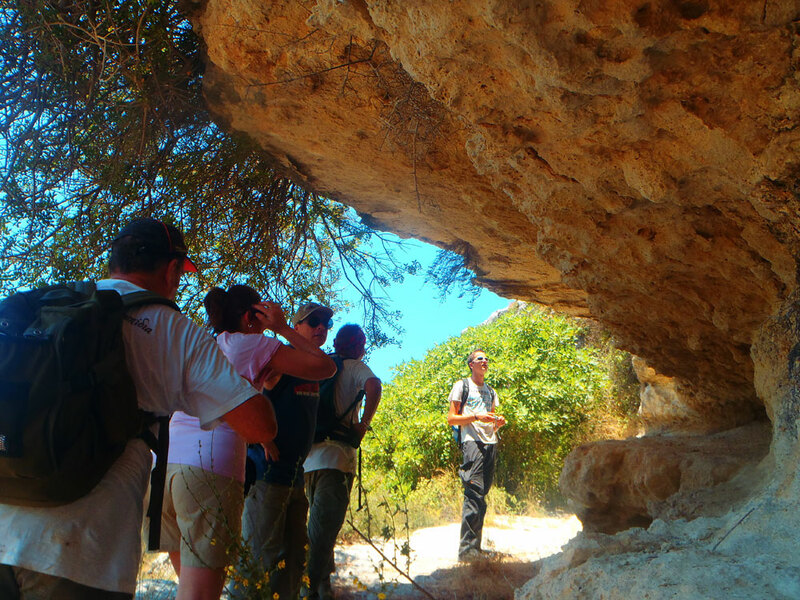 We offer opportunities for individual walks or group walks. Hiking & accommodation on Crete: Our apartments are located directly on the seafront and are suitable for everybody, from families and groups to singles and couples. Photo book hiking on Crete: Here you find an summery of our hiking pictures. 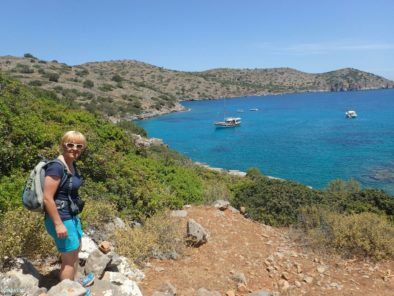 Throughout the years we have collected many photos, but we have put them in an overview for you to show you the numerous possibilities for a great walking holiday on Crete. YouTube hiking films about Crete: We have also made many short hiking films to show you what we have to offer on hiking holidays on Crete. All the films have been compiled both summer and winter. Every week we add something new to them. 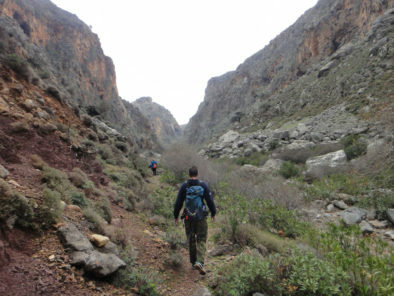 News about hiking in Crete: A page for daily news about excursions in unknown areas on Crete. All year round we upload daily news about our tours on the island. This can be from pictures to new recipes for Greek cooking, you name it and you will find it here. 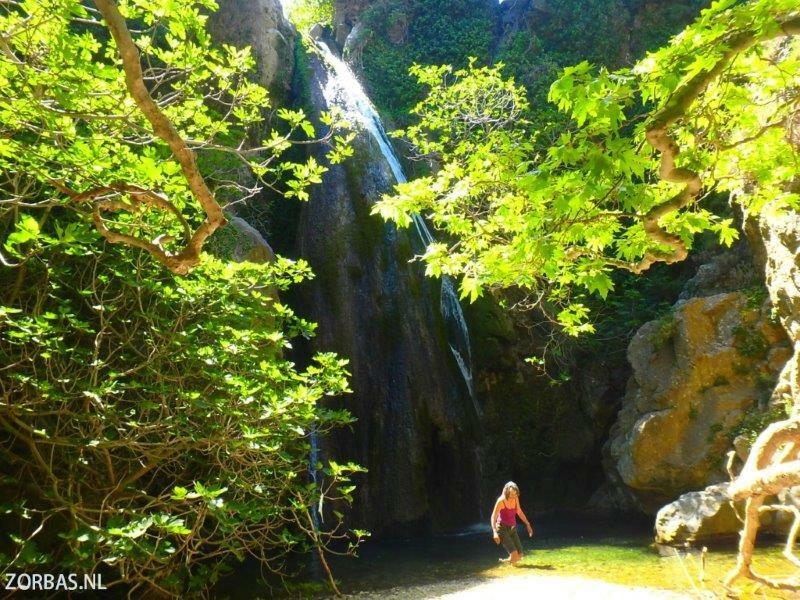 Gorges or canyons Crete: Once you have been reading about the numerous walks we organize, you will quickly come to the conclusion that there are many gorges on Crete. It is not only the Samaria gorge or the Imbros gorge. Crete even has the nickname “the island of the 100 canyons”. Anyone who reads more into it, will come to conclusion that this is no exaggeration. 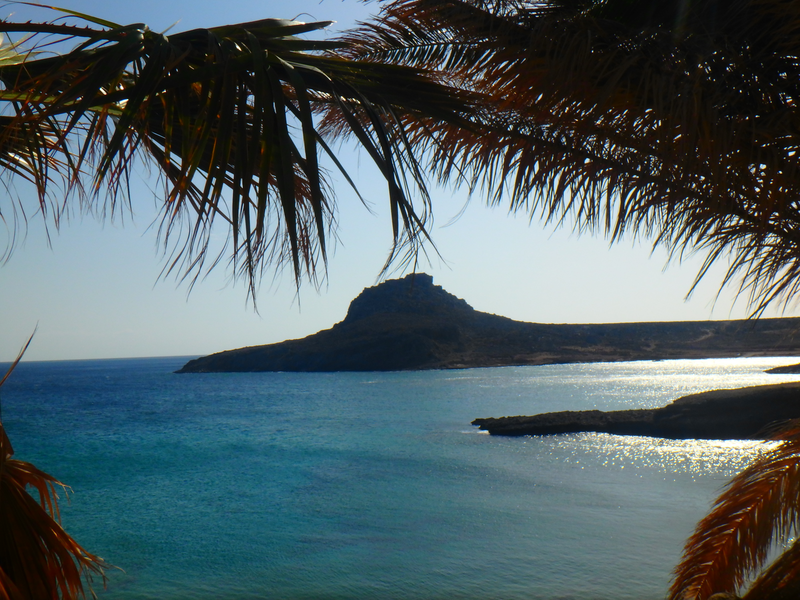 Holidays on Crete: Apartment rental and accommodation on Crete, all year round. It is the perfect place for family apartments and holiday homes, all your excursions and cheap flights to Crete.